For years I’ve enjoyed sometimes making a white chicken chili, just on the stovetop, with boneless, skinless chicken breast, onion, canned green chilis, and cannellini beans. Since I’ve been smoking meats in my old gas grill for the past year or so, I decided to switch that recipe up; here’s a smoked chicken chili made with those same canned white beans and accompanied by other fresh ingredients. This sacrifices the unusual, uniform white color of a white chicken chili, for the darker tones one would expect to accompany chicken, onion, and peppers all wood-smoked for hours. First, I smoked the chicken breasts (lightly salt-brined overnight), halved onion, and cored poblanos for about 3 hours, total, 160-200°F. Note, the smoking phase should not bring the chicken breasts, inside, to safe temperature to consume. That’s intentional, because it will finish, simmering at a low boil in the chili. Next, prepare like a typical chili in a stockpot: sauté the onions and peppers, chopped to a fairly fine size, in vegetable oil, add minced garlic cloves and spices. Dice the smoked chicken breast, add to pot, stir, add the soup stock; bring to a boil, stirring occasionally, then reduce to a simmer. Add the cannellini beans for about the last half hour. You’ll be less likely to crush them while stirring if you delay adding them. I simmered the chili for about 1.5 hours, total, stirring occasionally, and adjusted the salt and spices to taste, while some water boiled away, concentrating the flavor. We served this Smoked Chicken Chili as one of three chilis to a gang of guest friends, at home, with choice of many toppings and hot sauces, including homemade cornbread croutons. These substantial croutons work nice in that they soak up a bit of the liquid, but still stay crunchy. The two other chilis were a Chili Verde, made with pork loin roast and canned tomatillos, and a veggie chili, with corn, a variety of canned beans with the can liquid, and Adobo seasoning. So, if you enjoy smoking meats on the grill and have some time to put your talents toward a great chili, give this one a try! Well, I guess I’ve been away from this blog for a loooong time! Things are going well, I just haven’t been cooking too many new things. Swordfish a favorite and surprisingly easy, er, quick anyway. I made the salsa the other day with a couple lightly boiled cobs of fresh corn, a can of black beans, a touch of lemon juice, cider vinegar, red pepper, onion, apple cider vinegar and spices. I didn’t measure anything, but I’ve included a recipe below that’s a good basis for the blackening spices. Coconut-crusted swordfish steak with dragon fruit slaw and jasmine rice. Prepare the slaw much as you would any fresh cabbage and vinegar-based coleslaw. Wait until the end, though, to carefully stirring the cubed dragon fruit in, when your slaw has been otherwise prepared to your liking. Some dragon fruit slaw ingredients. While the slaw sits for a while, salt and pepper the swordfish steaks and coat with flaked coconut. For the sauce, simply stir about a teaspoon of corn starch into the orange juice and set aside for after the fish has been cooked. Coconut-crusted swordfish and sauce ingredients. Add a few tablespoons of oil, e.g., canola, to a skillet heated medium to medium-high. Pan-fry the swordfish steaks, about 4-5 minutes per side (for these that were about 1 inch thick), flipping them over just once. Plate the steaks and keep them warm. Meanwhile, reducing the pan heat to medium-low and quickly sauté the whites of the scallion just lightly, combined with whatever coconut flakes remained in the pan. Next, immediately pour the orange juice and cornstarch mixture into the pan, stirring with the scallion and coconut until the sauce thickens. Preparing the coconut orange scallion sauce. Pour sauce over each of the swordfish steaks, top with scallion greens, and serve accompanied by the fruit slaw and perhaps also jasmine rice. This was a tasty meal. I’ve not prepared swordfish steaks before, but they were quite nice topped with this simple coconut-scallion-orange sauce. Swordfish is substantial in texture and was nicely contrasted by the fresh, crisp, spicy, tart, sweet fruit and cabbage slaw. I bet it would go just as well with a fruit salsa instead. Swordfish and dragon fruit burrito! Gominda Wak with basmati rice. 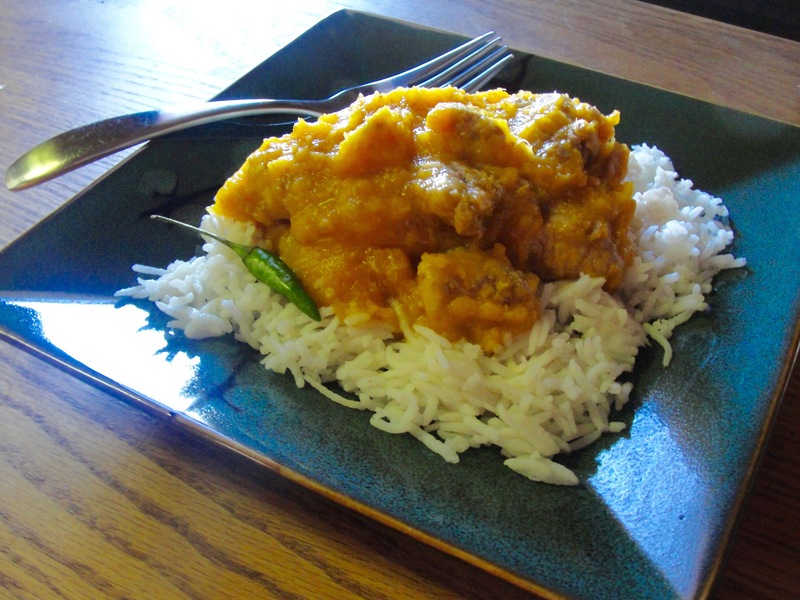 Perfect for an autumn meal: this is Gominda Wak (literally: “pumpkin pork,” also sometimes “Wak Gominda”), a hearty traditional stew from the Garo people in northeastern India. 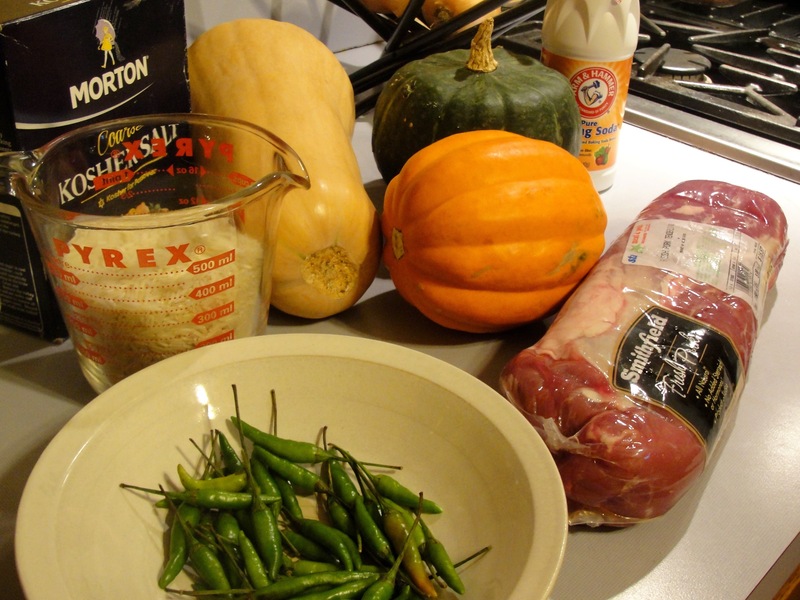 It’s a wonderful pork and squash dish that I was introduced to by my Garo friend, who helped prepare it here. It’s surprisingly simple – only 5 ingredients! Boneless pork; here we used about 3 pounds pork loin; a marbled pork roast might be preferred; it need not be this lean. Pumpkin or other squash, a couple pounds; we used about 2/3 in total of the acorn, butternut, and buttercup squashes shown. Chilis, e.g., 8-10 of the thai chilis shown here. Baking soda, about 1/2 teaspoonful. Basmati rice, to accompany the stew when serving. 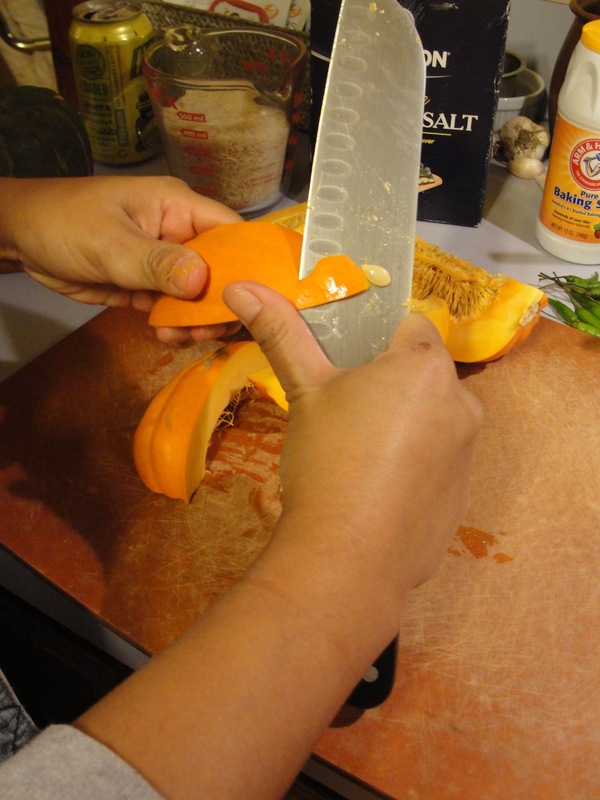 First, rinse, peel, and remove seeds/guts from squash to prepare it for cubing. 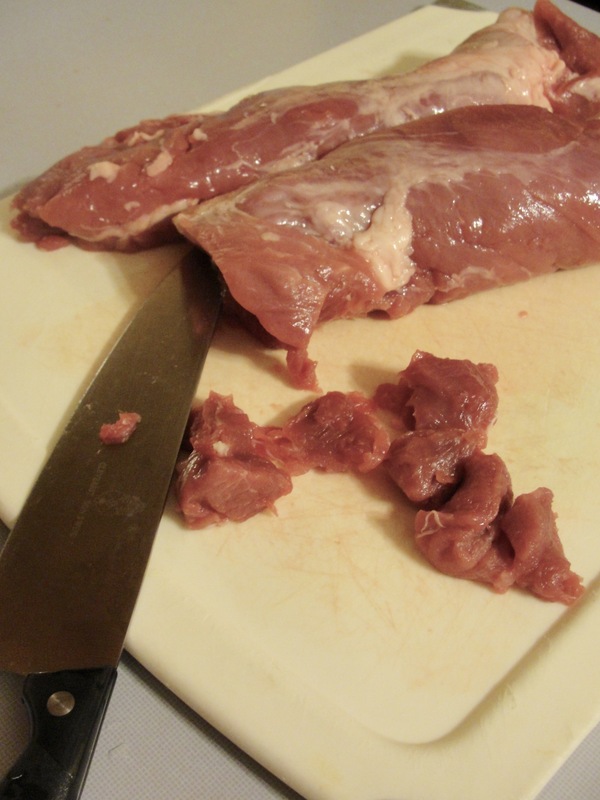 Cut the pork into large bite-sized pieces, trimming any gristly fat, but leaving some fat for cooking. Cut the pork into bite-sized pieces. 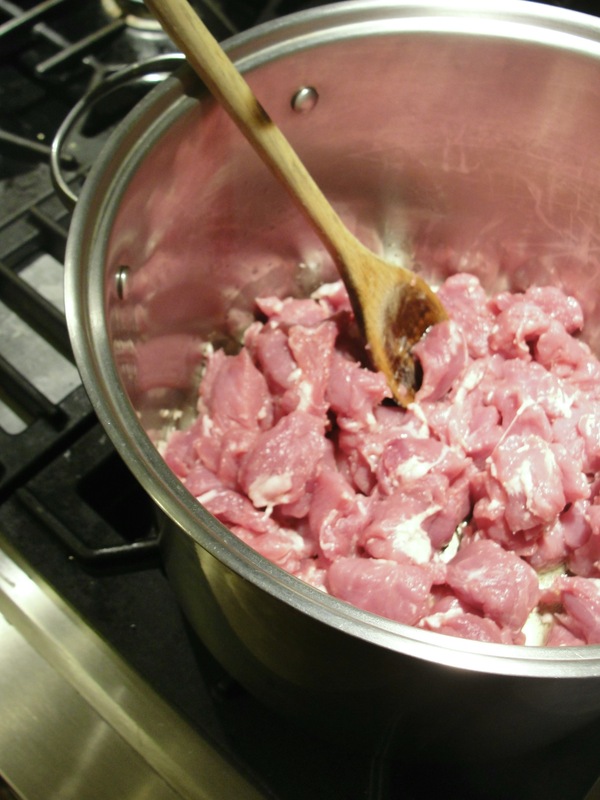 In a large pot, beginning cooking the pork pieces over medium-low heat with fat or oil, as necessary to keep it from sticking. Begin with the cubed pork, over medium-low heat. Cover the pork, simmering over low heat, stirring occasionally until fat renders and some water is released and cooked until white, i.e., at least mostly cooked through. While pork is cooking, remove the chili stems and cut the chilis lengthwise, just once so that their seeds can be released and they will disintegrate while cooking. Also, cube the squash. 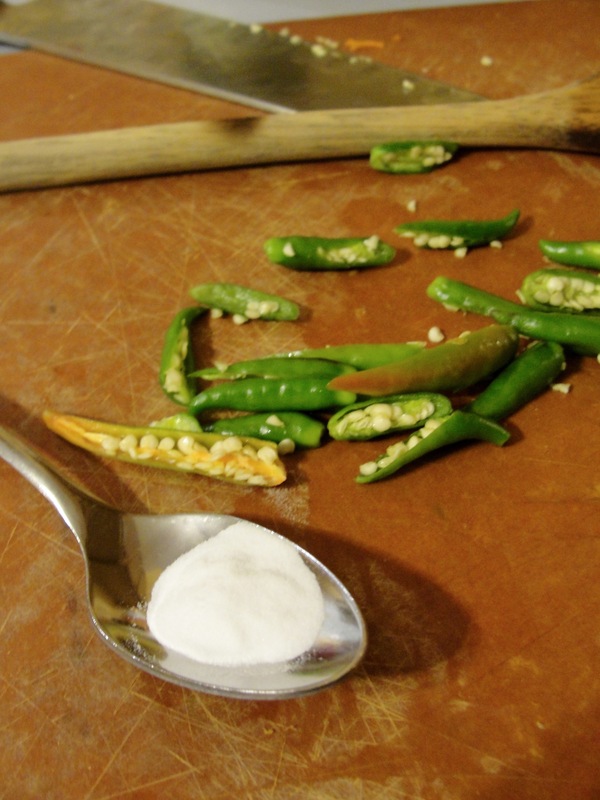 Baking soda and sliced chilis. Once the pork is cooked, add the soda and chilis, then stir. 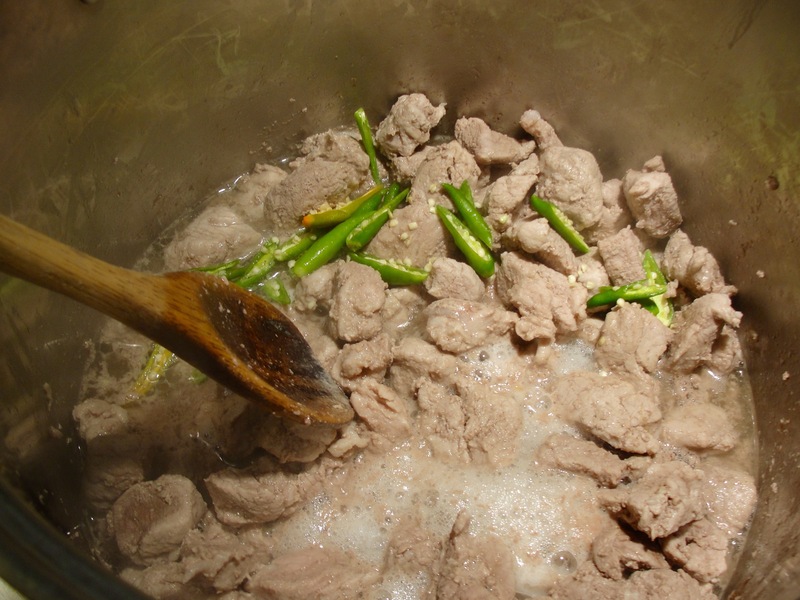 Add baking soda and chilis to cooked, stewing pork. Next, add the squash and a bit of salt, and then stir, so that meat is no longer on the bottom (to prevent burning). Increase heat to medium or medium-low, then cover and stir occasionally. 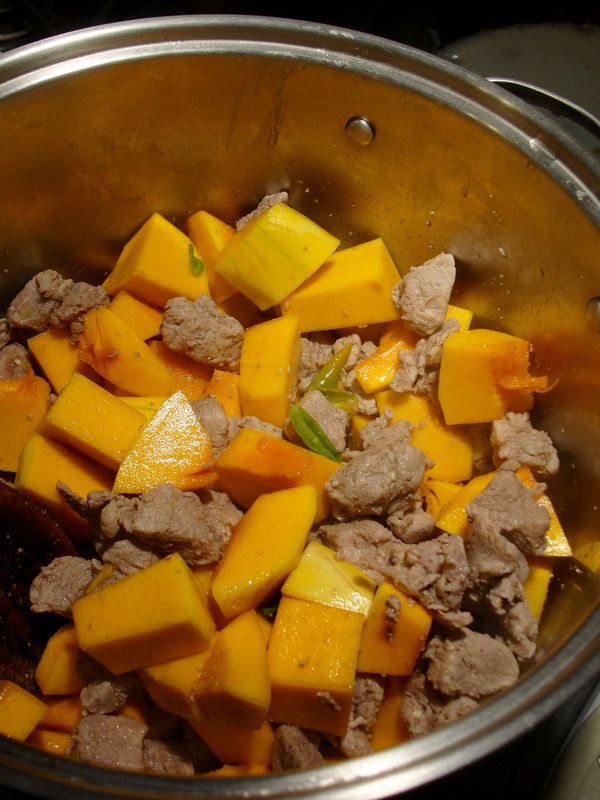 Add cubed squash to pork mixture. 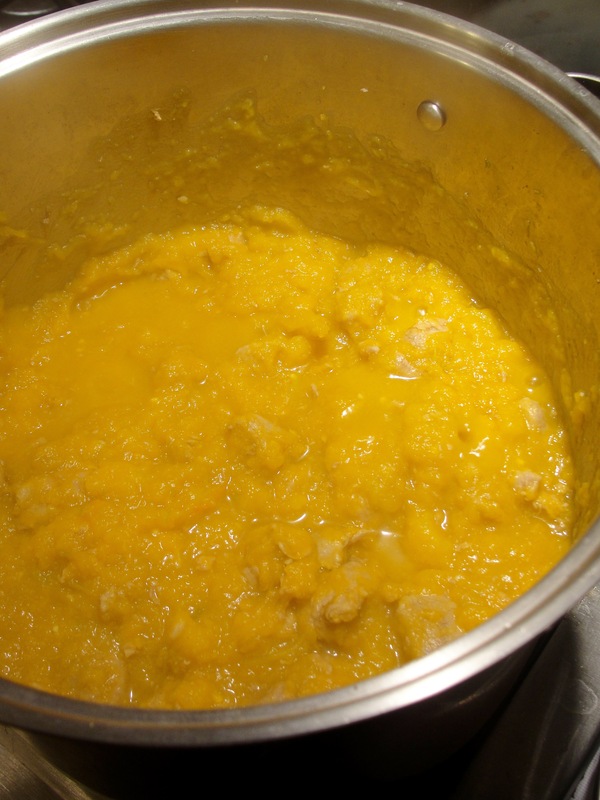 When lightly boiling in the water released from pork and squash, reduce to low heat and simmer slowly, perhaps 1/2 hour, until squash is soft enough to disintegrate. 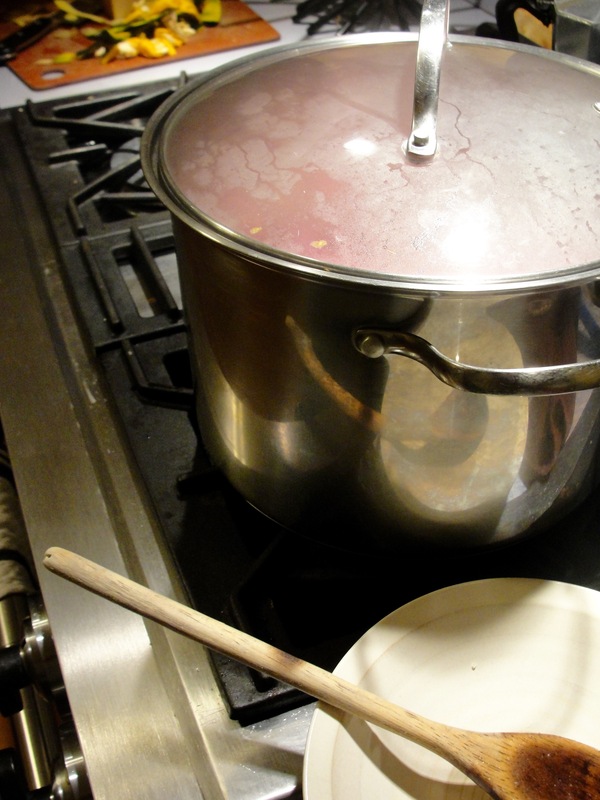 If necessary, add water sparingly, so that it boils but remains somewhat thick in consistency. 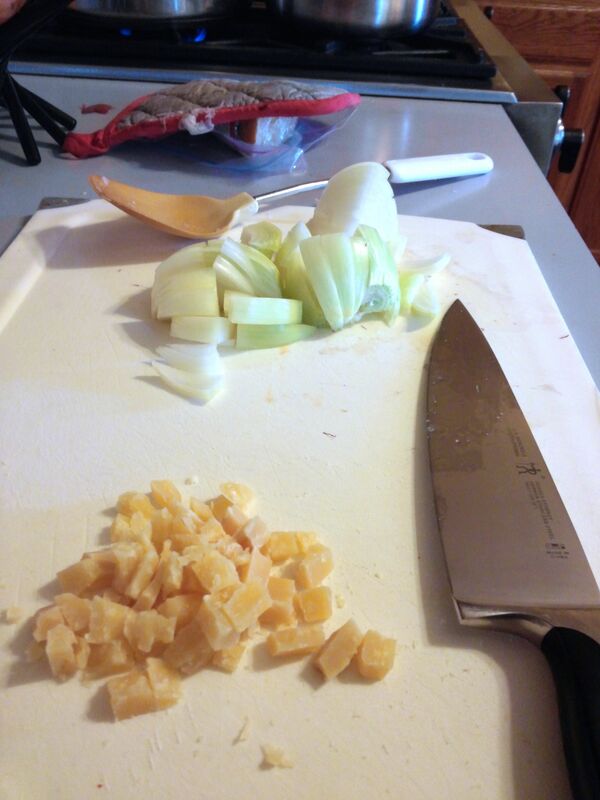 Stir and use a spoon to squash any whole squash cubes. 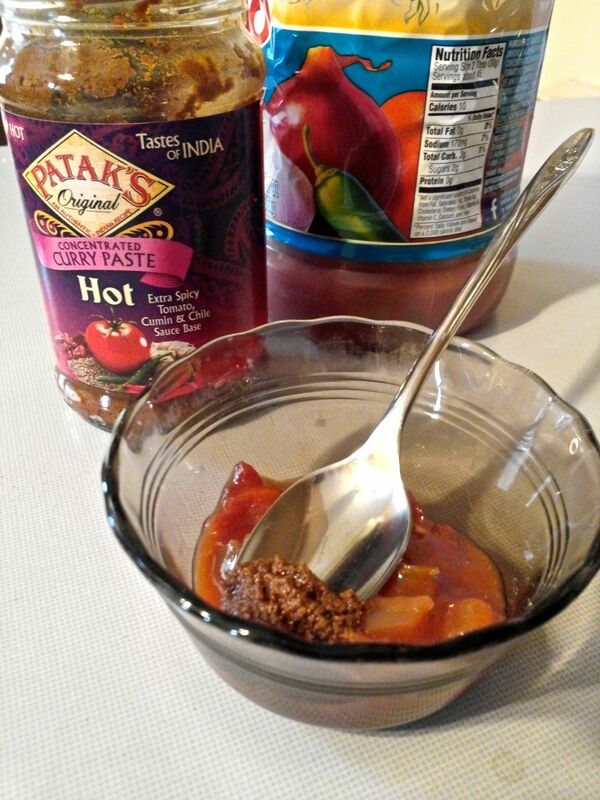 Taste for spiciness (it will likely be quite spicy with 8-10 thai chilis) and salt, and adjust as you like. You’re done! Serve over basmati rice and enjoy! 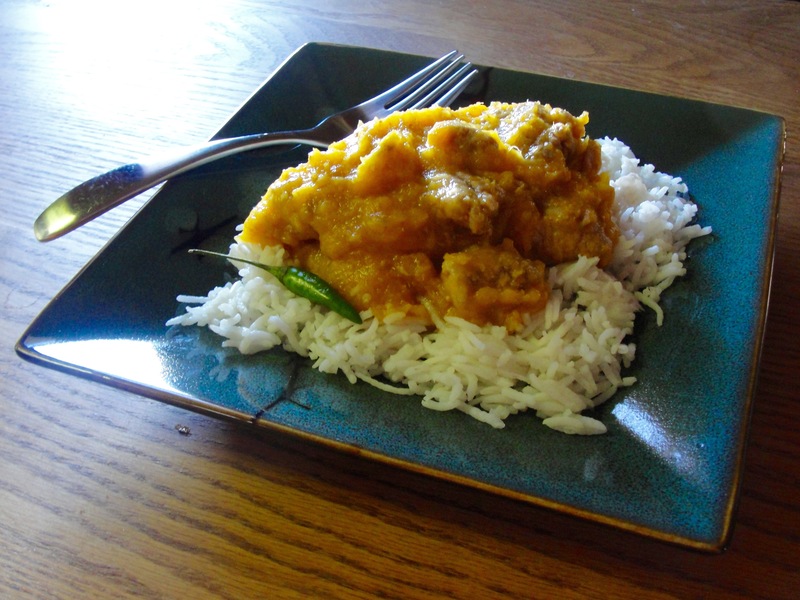 Pork and Pumpkin Stew over basmati rice. 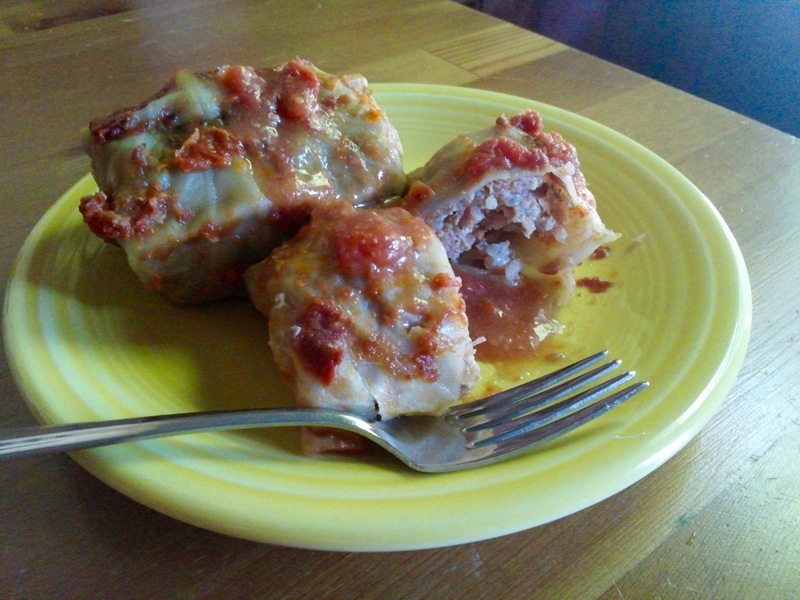 Gołąbki with tomatoes and sauce. The occasion that caused me to make gołąbki was that we have a Polish graduate student visiting for a summer internship at my work, and I thought he might like some taste of home… given that our Polish-named staples here in the U.S., such as Polish pickles or Polish sausage, are nothing like he knows from home. It also helped put a good dent in our CSA share of vegetables in that it uses a head of cabbage and my, unusual, vegetarian version also used a fennel bulb. There are many preparation techniques for gołąbki, some involving pan frying and then boiling or steaming them. I chose to use this recipe as the basis for my gołąbki, which simply has you to bake them, covered, in a 350° F oven for 2 hours. For the fillings, mix the above (except for butter, tomatoes and tomato sauce), in a large bowl similar to the way one makes meatballs; cover and refrigerate until ready to fill and roll the cabbage leaves. To prepare the cabbage leaves, I followed the method show in this video. That is, I brought a large pot of water to very low boil, enough water so that the whole cabbage head could just be submerged. Then removed the core of the cabbage leaves, and boiled it slowly, carefully removing the leaves one by one with tongs and cooled them on a cutting board. It’s important to remove the core complete so that the leaves can separate as they soften and loosen while boiling. Once the baking dishes are filled, pour the diced tomato and tomato sauce over the top, spreading evenly, and sprinkle again with marjoram. 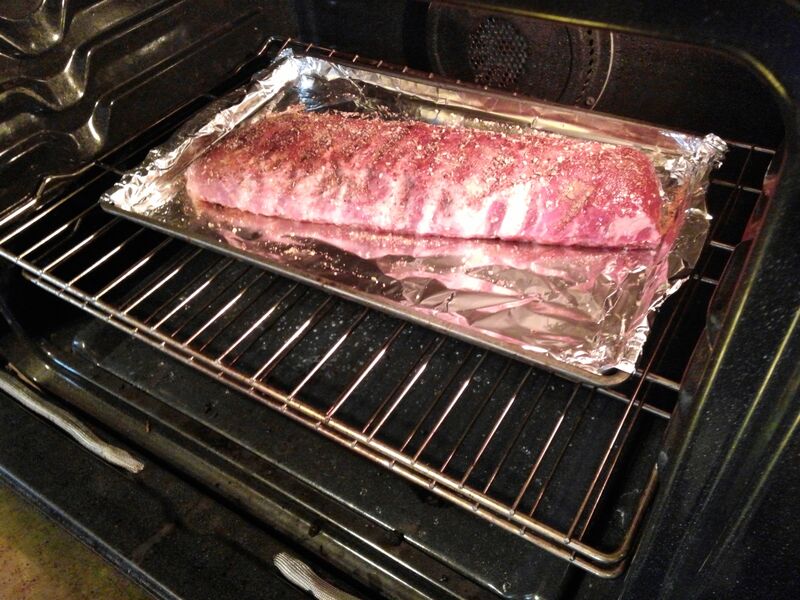 Cover the dishes tightly with aluminum foil and bake in a 350° F oven for 2 hours. Gołąbki, ready to be covered and baked. Once cooked, let the gołąbki sit and cool a bit and serve them, accompanied by a dollop of sour cream if you like. Gołąbki with tomato sauce, served with sour cream. I really enjoyed making and eating these.These are also nice left-over, even frozen and reheated as necessary; this is a good thing, since it’s best to make quite a large batch given the work. My Polish student friend liked them, but rated them as spicier than his grandmother’s version. 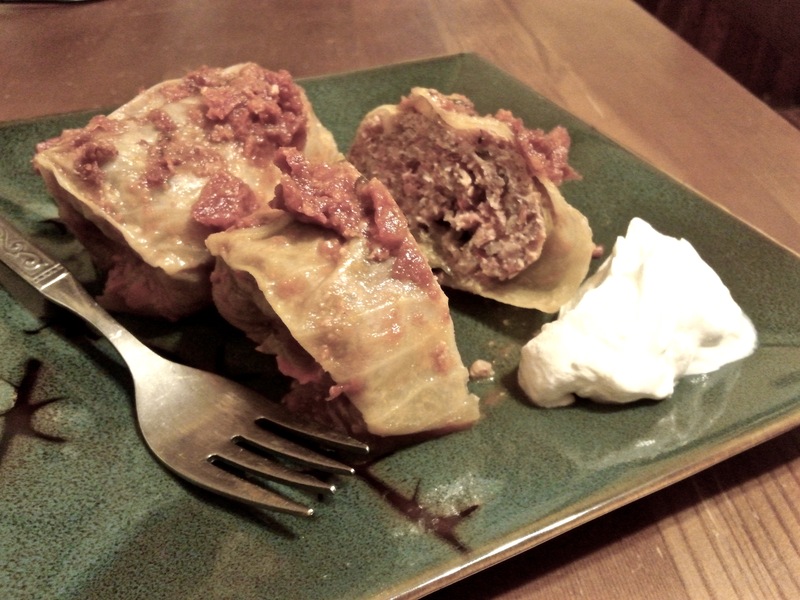 (That was by design, in that I used a medium spicy Italian sausage rather than the typical blander combination of ground pork and beef that most gołąbki recipes call for.) He also noted that they leave the tomato sauce to be added only after cooking. Brussels Sprout and Ham Fried Rice. 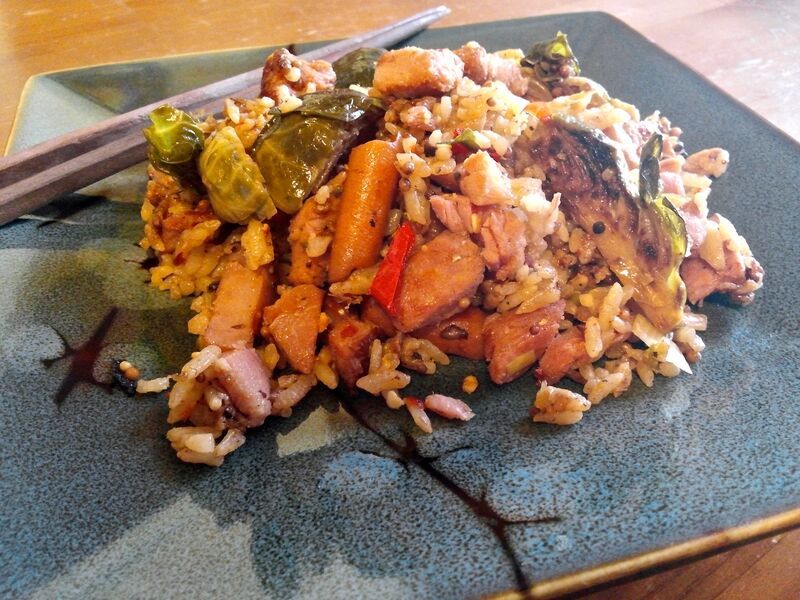 With the goal of making use of some of the leftover Easter ham (admittedly, my Easter is more of a meal than a religious experience… unless the food is exceptionally good), we decided on a dinner of Brussels Sprout and Ham Fried Rice. This was a bit of an East meets West fusion flavored with a touch of mustard and whole mustard seed. 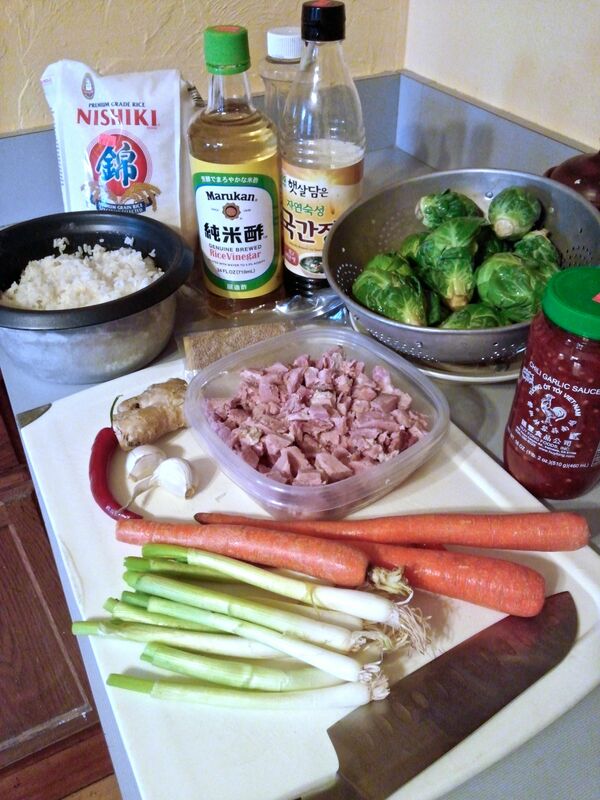 Ingredients for Brussels Sprouts and Ham Fried Rice. 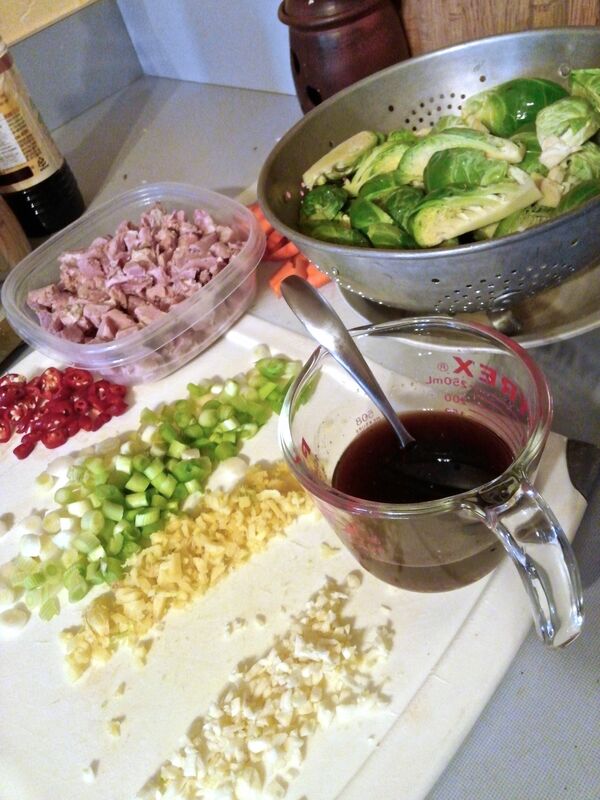 Prepped ingredients for Brussels Sprouts and Ham Fried Rice. The sauce was what I typically do for fried rice: a combination of soy sauce, water, rice vinegar, chili garlic sauce, and something sweet (this time a bit of brown sugar), but this time I also added a couple tablespoons of a coarse brown mustard. Yellow mustard seed in oil. The frying started off with yellow mustard seeds in oil. 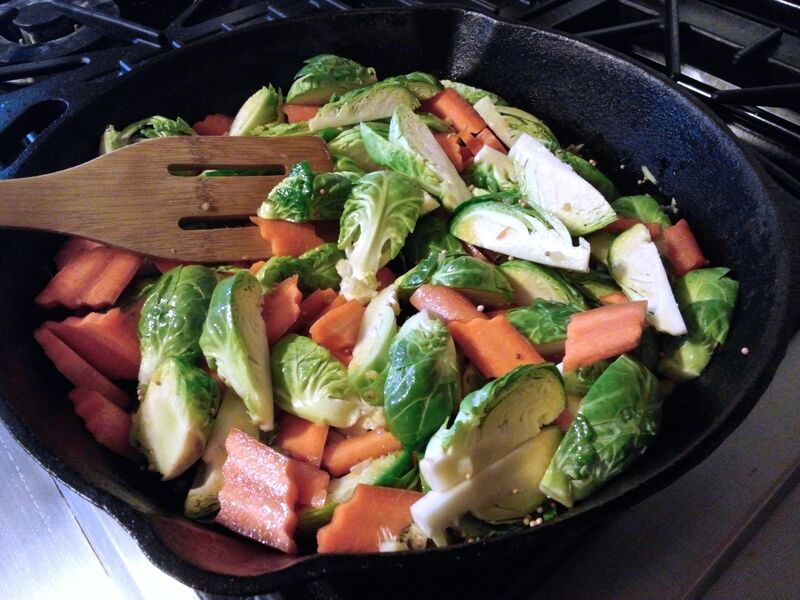 Fresh Brussels sprouts, sliced carrot, and ginger. 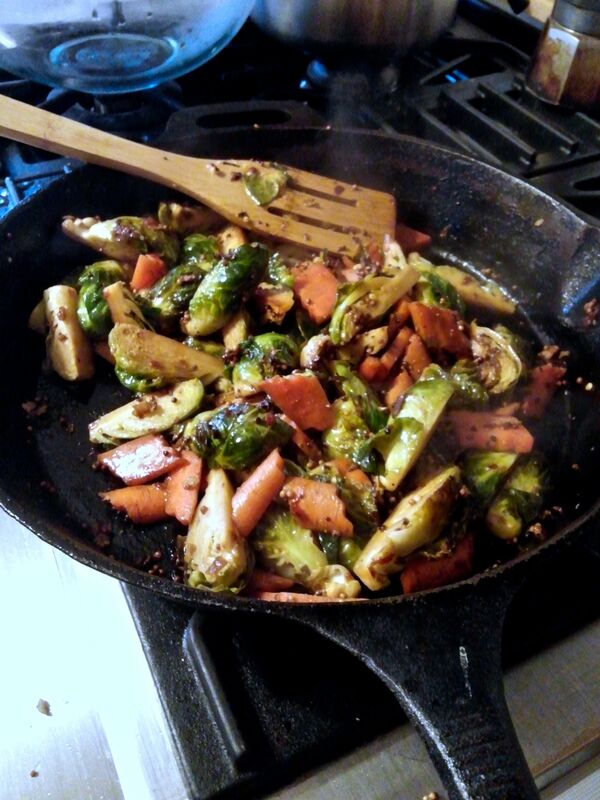 Stir frying the Brussels sprouts, carrot, and fresh ginger in mustard seed and oil. stir-fried in hot pan until they were cooked through and a bit blackened at the edge. I used a bit of the sauce and a bit of water to keep the fond in the pan from burning by sort of deglazing it along the way. Stir frying the ham, garlic, spring onion, red pepper, and rice. 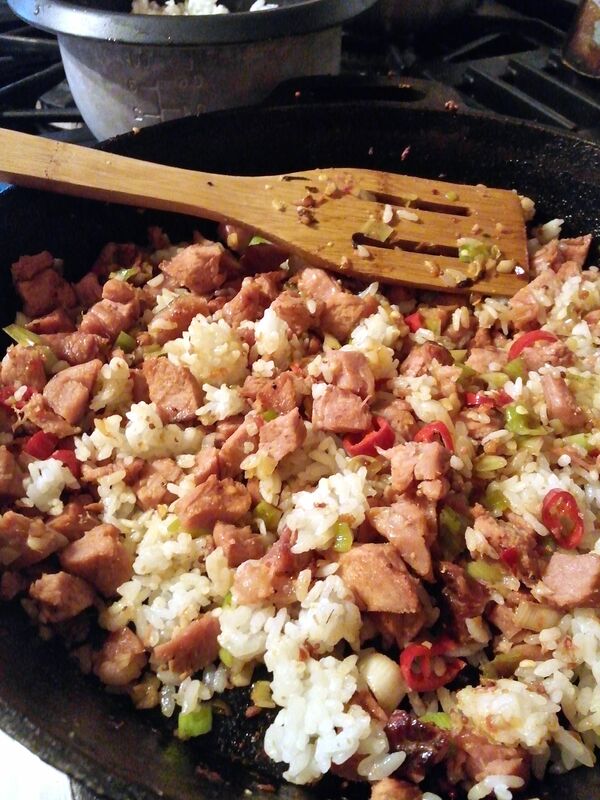 The rice and ham were stirred in and fried a bit over medium heat, and, lastly, the spring onion, hot peppers, and sauce added. I served this fried rice accompanied by a glass of Red Rice Ale, an appropriate fusion beer for an asian fusion fried rice! 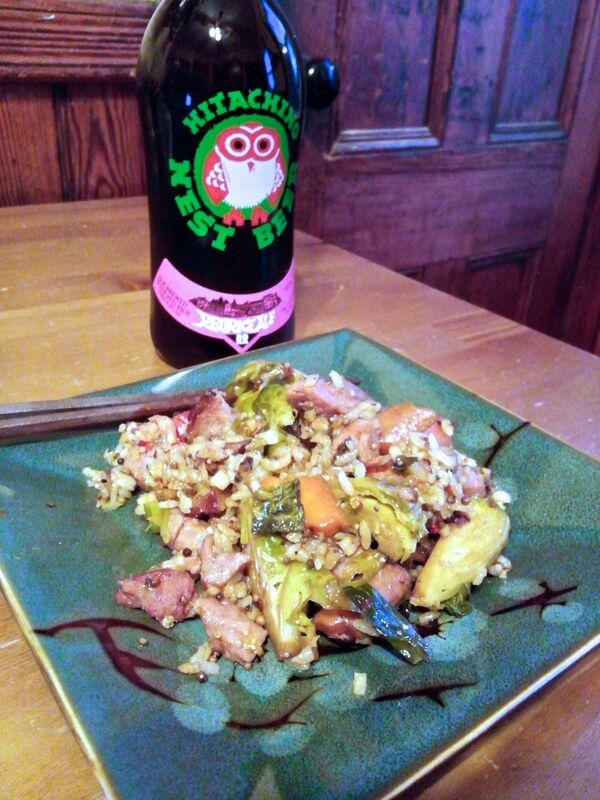 Brussels Sprout and Ham Fried Rice served accompanied by Hitachino Nest Red Rice Ale. Corned beef and cabbage pie. Still, I appreciate the frivolity of partying for no real reason other than the coincidence of a date and mathematical constant, so I’m up for a Pie Day this year and looking forward to the upcoming Saint Patrick’s Day, at least the ridiculous way we observe it in the United States: with lots of beer and delicious corned beef and cabbage, but perhaps not the parades. For this meal we decided to roll Pi Day and Saint Patrick’s Day treats into one: a meat pie. While corned beef and cabbage would be wonderful fillings for, say, cornish pasties, today’s pie should be as round as possible. 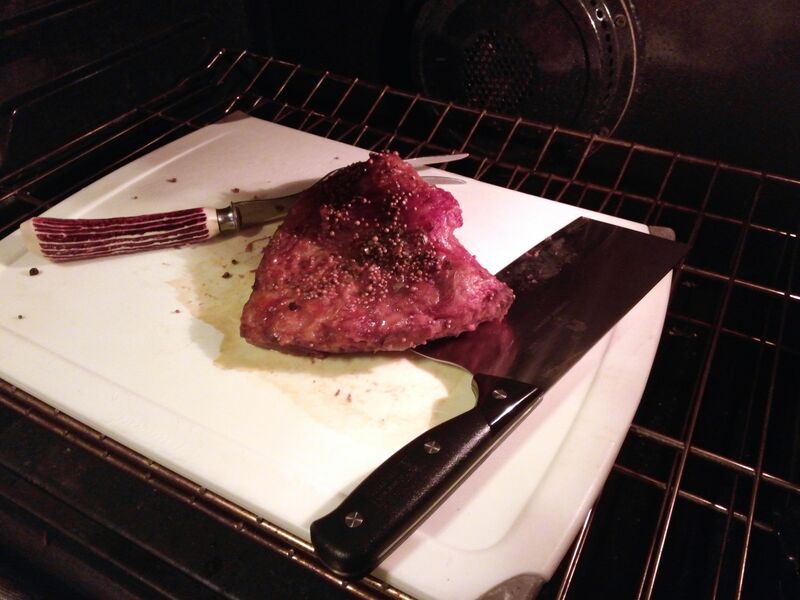 To begin preparing the pie filling, we cooked a store-bought corned beef brisket (3 1/3 pounds including liquid in package) in a roasting pan in the oven. The roasting pan was filled to about 1 inch depth with a mix of water and beer (a bottle of Milwaukee Brewing Co.’s Polish Moon sweet milk stout), pepper corns, whole mustard seed and the random pickling/corning spices supplied in the package. Specifically, we cooked the brisket, fat-side up, for 2.5 hours, covered, at 350° F and then about 20 additional minutes, uncovered, at 375° F.
Corned beef brisket cubed for pie filling. After resting for some time, about half of the brisket (perhaps a bit more than 1 pound), was cut into medium/large cubes. While larger than the vegetable filling ingredients (below), I wanted to retain the meat texture rather than turning it all into a fine mince. 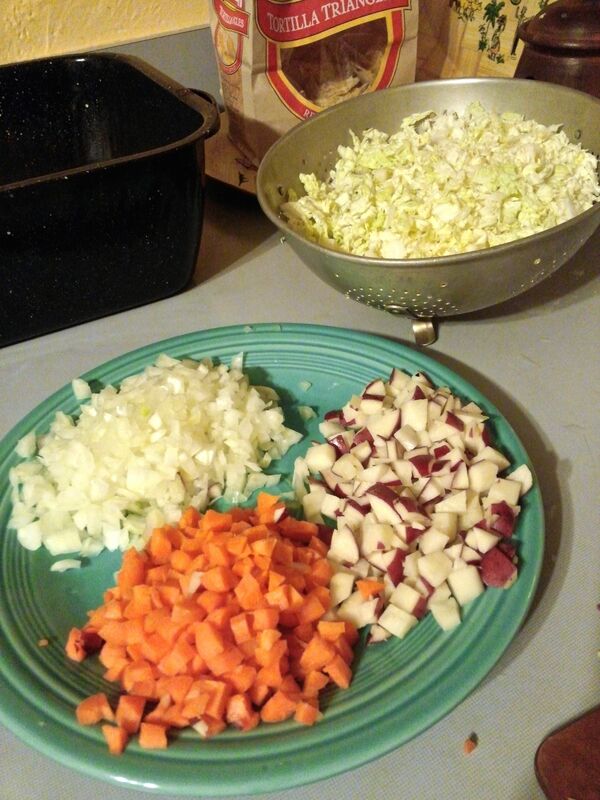 Onion, carrot, potato, and cabbage for pie filling. 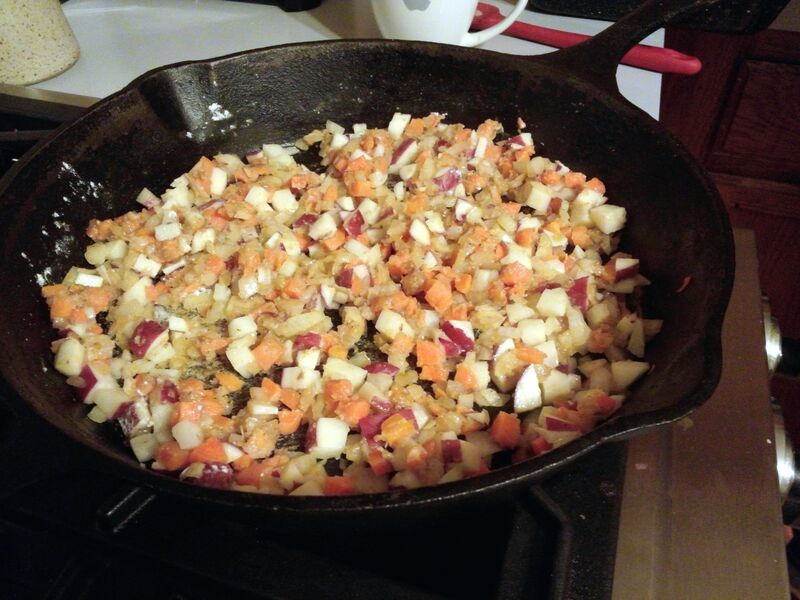 To prepare the filling, we finely chopped or cubed savoy cabage (1/2 head), yellow onion (1/2 large), carrot, and a few red potatoes. These were then sautéed in fatty drippings from the corned beef, and seasoned with dill and thyme. Sautéing vegetables for pie filling. 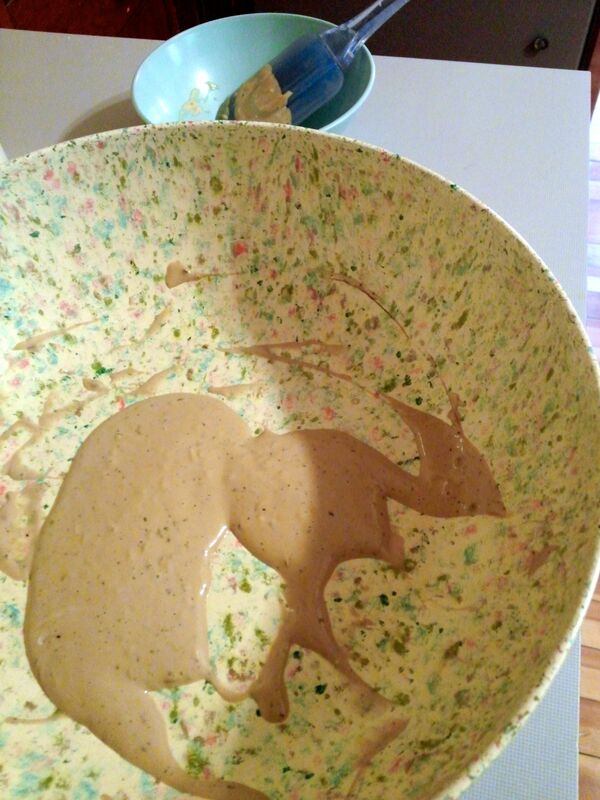 So that the filling would be moist, we added water and flour to thicken into a roux-like sauce. 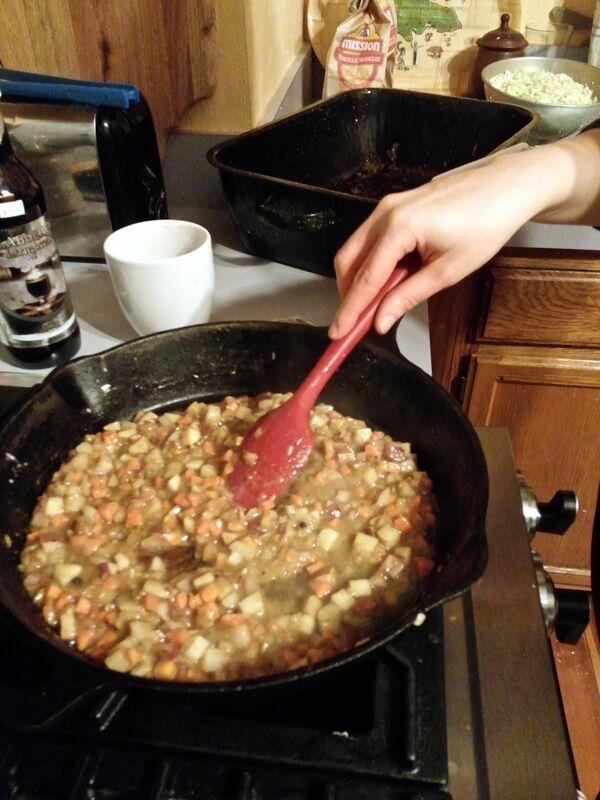 Add water flour while sautéing to make a roux-like sauce. 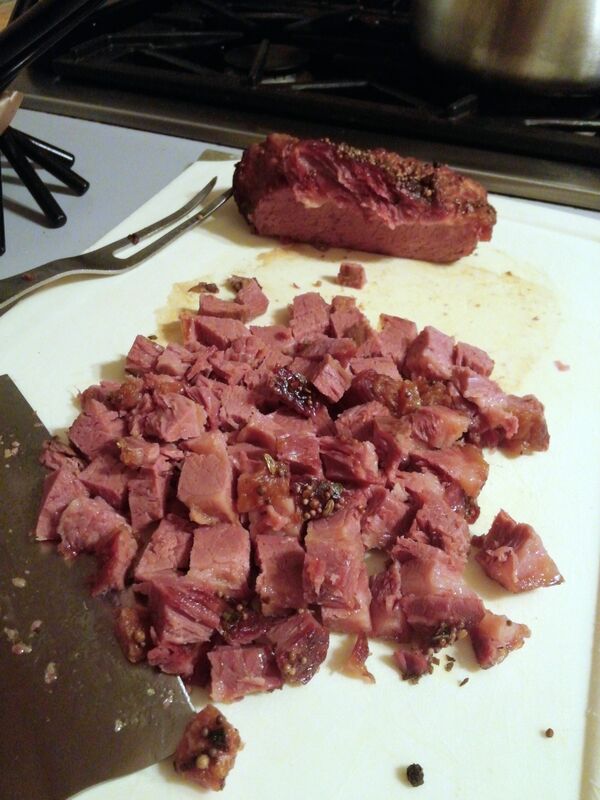 Finally, the filling was seasoned to taste with the additions of ground black pepper, nutmeg, and mustard (e.g., Grey Poupon Country Dijon) and the cubed corned beef added; since the corned beef and its drippings are so salty, there’s definitely no need for added salt! 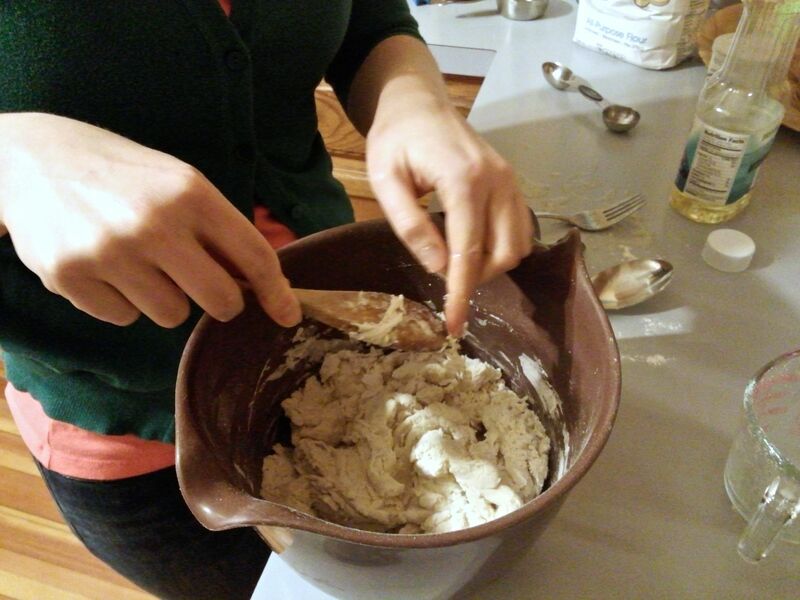 Preparing the pie crust dough in a food processor. 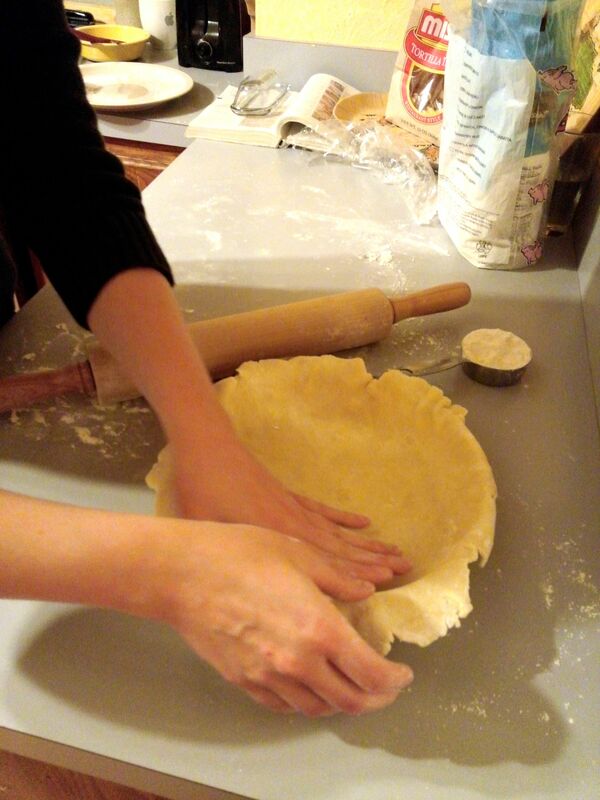 Now, on to the pie crust… not our area of expertise, but my partner volunteered to do all the work here; she prepared a wonderful flaky, cream cheese pie crust guided by this recipe and some tips from a Betty Crocker cook book. 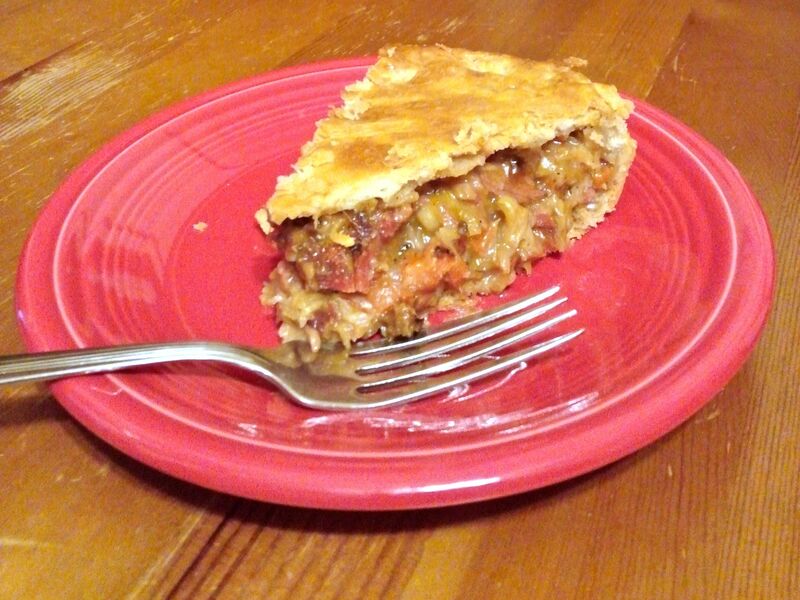 If you’re not willing to make the pie crust from scratch, I’ve had good luck using Trader Joe’s pie crust, although it is sweeter than this and a bit sweeter than I like for a savory meat pie. 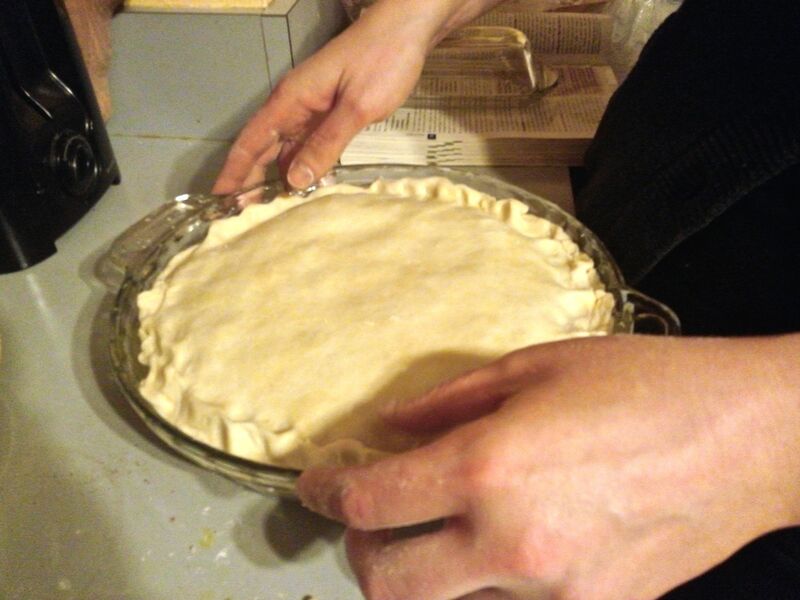 The pie shell was filled and the top piece cut slightly larger than the pie dish, so that it could be folded over the edge of the lower crust piece, and pinched closed. 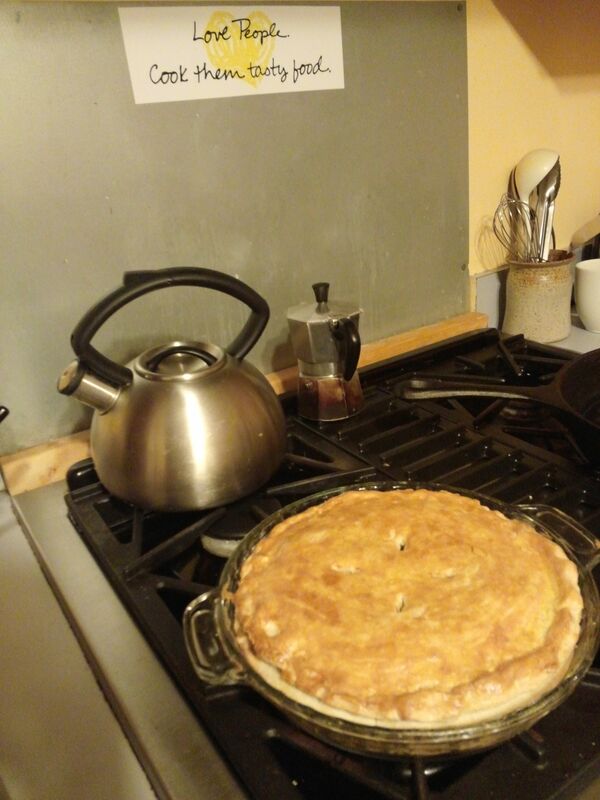 Vent slits were cut into the pie top, and we baked it for about 45 minutes at 375° F, painting the top with an egg wash about half way through the cooking, and removing it when the crust was a beautiful golden brown. 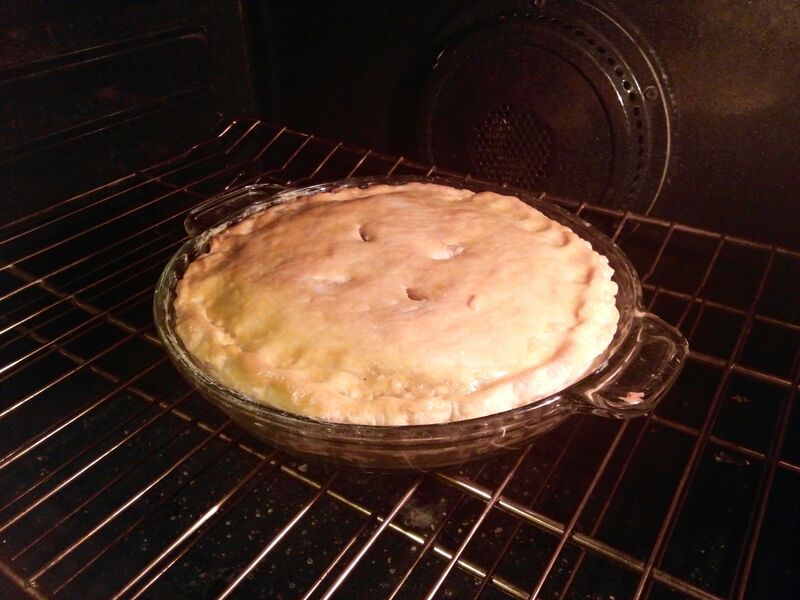 From the oven, let the pie rest for a bit and enjoy a beer before digging in. The finished, resting corned beef and cabbage pie. 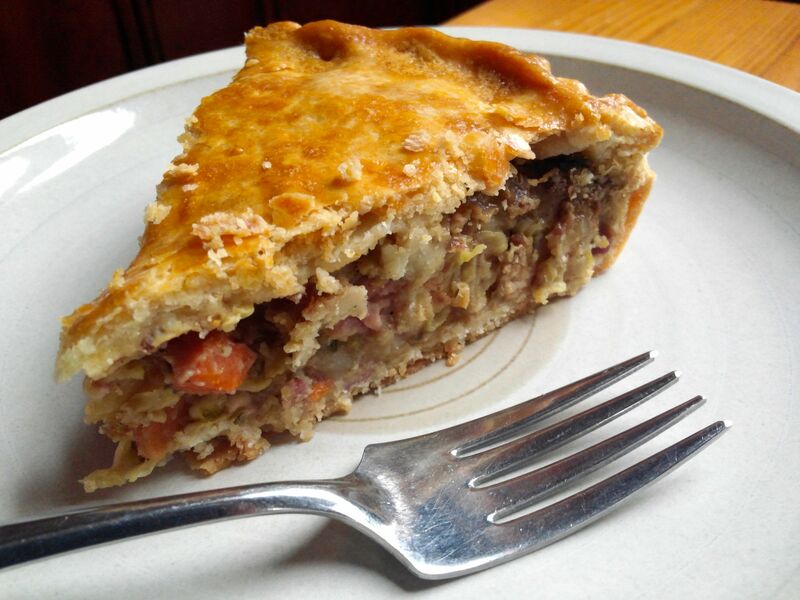 A slice of corned beef and cabbage pie. This was a great dinner, and the leftovers look good too… so I’ll have it both for Pi Day and for Saint Patrick’s Day. This would make a fine meal for Saint Patrick’s Day itself or based on the leftovers from that feast. 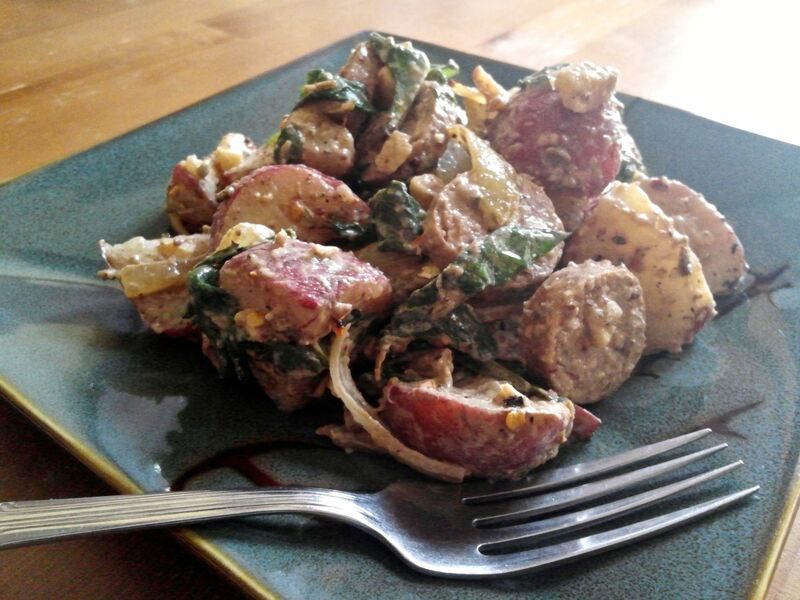 Potato and Italian Sausage Salad. 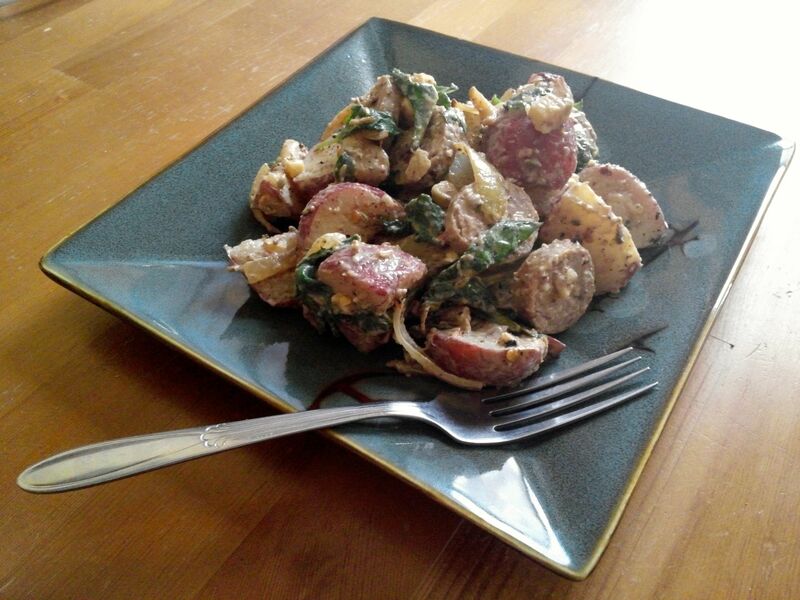 A fellow blogger that I’ve just begun following recently posted a winter potato salad that is different than most potato salads especially in that it contained sliced kielbasa sausage. 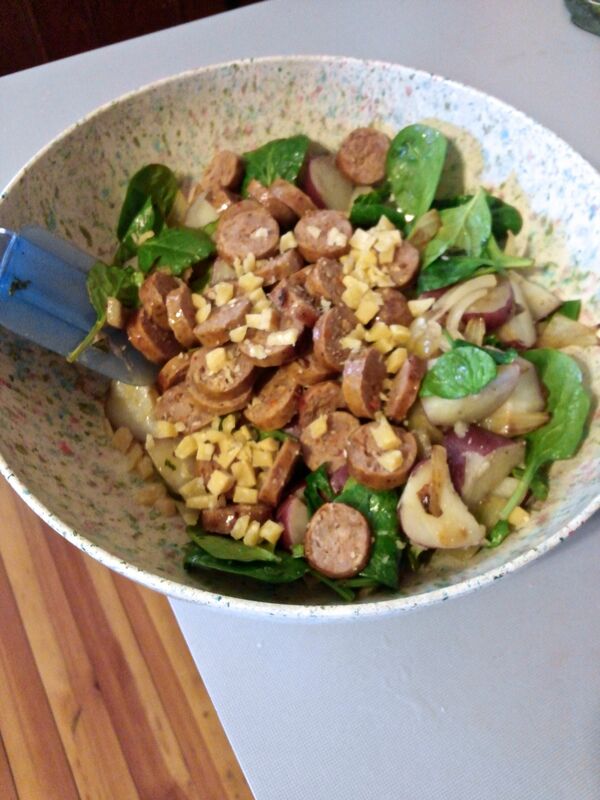 While I’m happy to eat vegetarian dishes, this struck me as particularly satisfying to serve as a meal, so I considered what ingredients I had on hand and came up with this idea: potato and Italian sausage salad. My version is similarly of the season in that today is a cold, snowy New England day… the sort that dissuades you from running to the market for just the right ingredients. My dressing had a generous amount of fennel seed, freshly ground black pepper, and red pepper flakes. 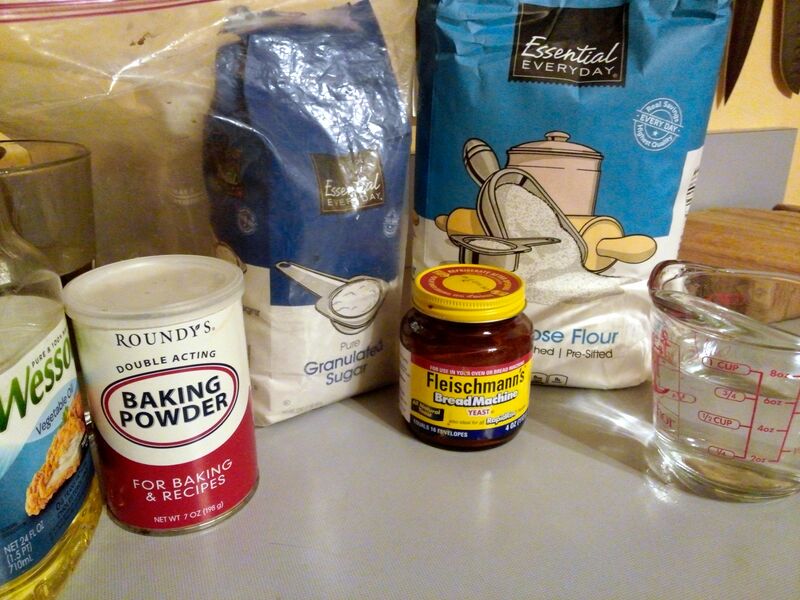 As usual, I didn’t measure my ingredients; if you need hints on quantities, consider this recipe. I originally meant this to be a potato salad with Italian flavors, but punched it up with Dijon mayonnaise, that of course goes quite well with sausage and potato. Start by steaming the quartered potato; cook until tender. Meanwhile, cook the sausages. Mine were frozen, so I start by boiling them then, after cooked thoroughly (in a skillet of just-boiling water, over medium low heat, perhaps 20 minutes), poor out the water and brown them. 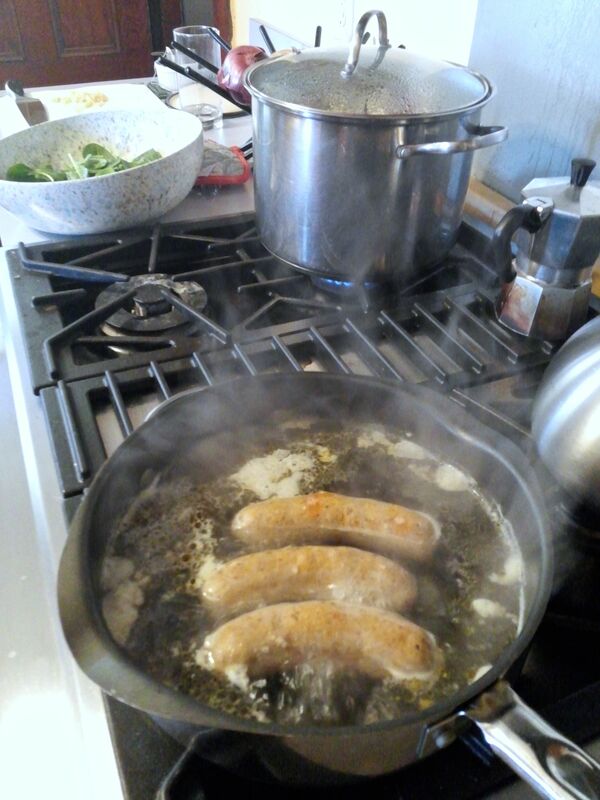 Boiling fresh Italian sausage and steaming red potato. While browning the sausages in a pan, add the sliced onion and brown it as well. 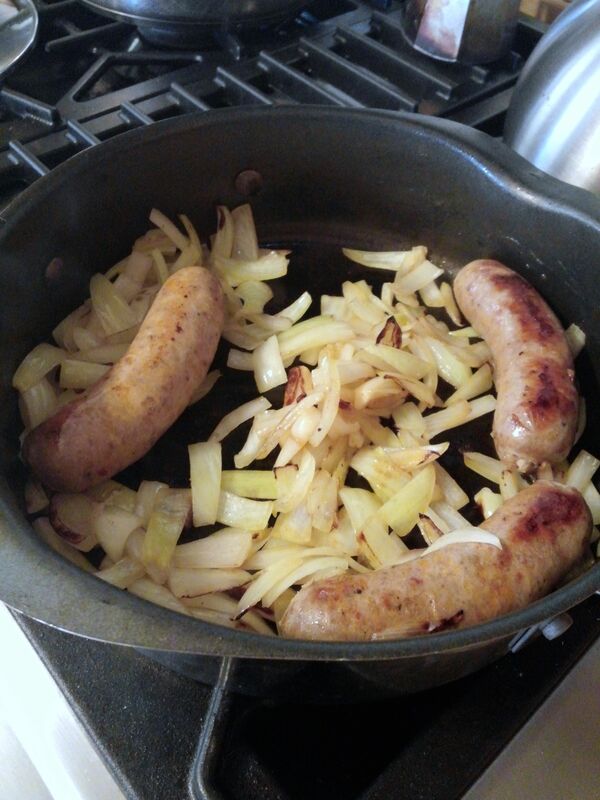 Browning onions and cooked Italian sausage. When the potatoes are tender, remove from heat, but add the spinach to the steamer basket (and cover) to lightly steam the spinach. Once all these ingredients are done, let them sit perhaps an hour to cool to approximately room temperature. This is a good time to prepare the dressing in which you’ll toss the aforementioned prepared ingredients. Whisk the dressing ingredients in a large bowl to taste, to yield approximately 1/3 cup total; you might wish to use some water to dilute it to a consistency suitable for tossing. 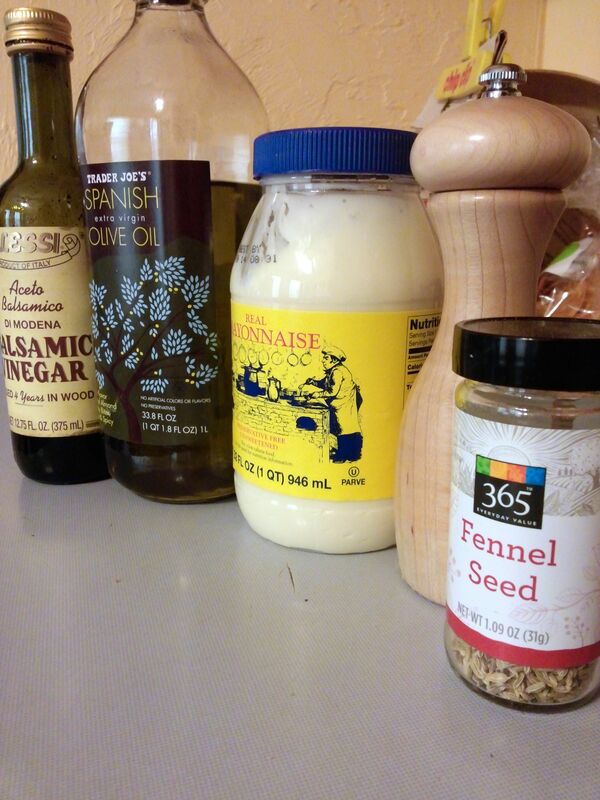 A salad dressing of mayonnaise, olive oil, balsamic vinegar, fennel seed, freshly-ground black pepper. 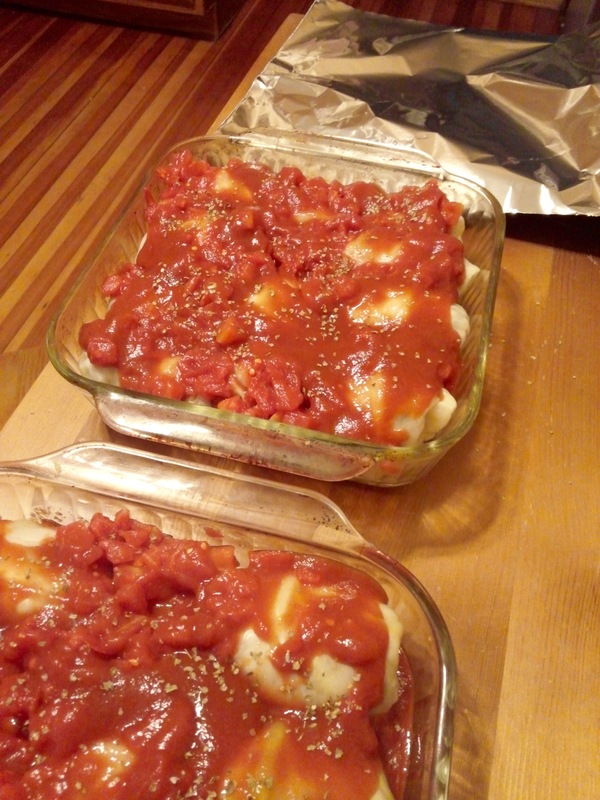 Once cooled, toss the cooked ingredients and cheese in the dressing. 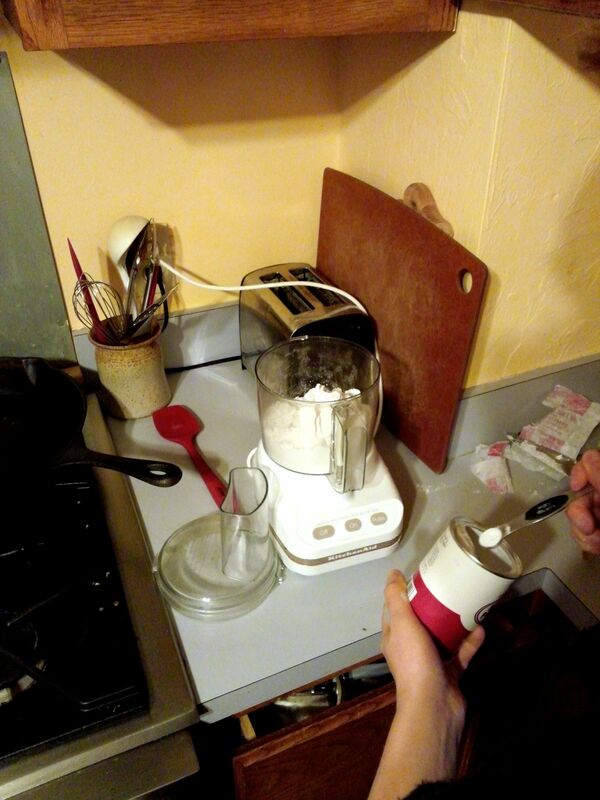 I used a bowl scraper to turn and distribute the dressing ingredients. Ready to toss the ingredients with the dressing. Lastly, refrigerate the salad for a number of hours, tossing occasionally to redistribute the ingredients and dressing; also, taste test it and, if desired, add more diluted mustard, black pepper, and/or red pepper flakes. Letting the salad sit for a time also allows the fennel seeds and had Italian cheese to soften slightly before serving. I removed this salad from the refrigerator for an hour or so and served it at about temperature for dinner. It’s an unusual “meat and potatoes” meal, but perfectly satisfying all on its own! Gua bau with five spice ribs and pickled vegetables. One of my long-time favorite Chinese treats is cha siu bau: the tasty steamed buns filled with delicious char siu-barbecued pork that is common at dim sum meals. The Taiwanese gua bao is a similar street food in which the ingredients are inserted in a folded bao after the flat bun is steamed; gua bao have become popular restaurant items in North America lately; for instance, I ordered them at Bahn Mi Boys in Toronto, where they offer a variety of fusion bao fillings. For our version, we decided to prepare the steamed bao from scratch and dry-rubbed pork ribs and Chinese pickled vegetables for fillings. 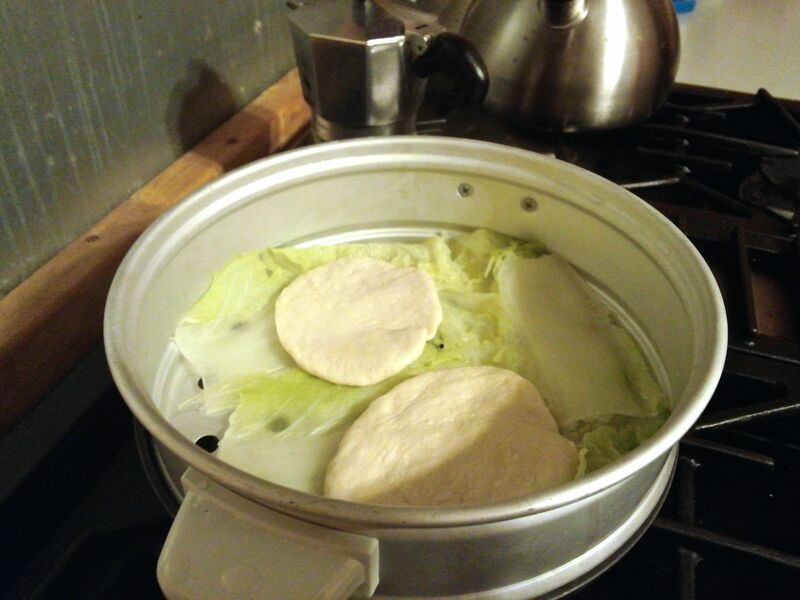 As one friend said, ribs in the oven are pretty much “set it and forget it.” Along with the requisite time for pickled vegetables to take on the pickling flavors, there’s plenty of time to dabble in making steamed buns from scratch. 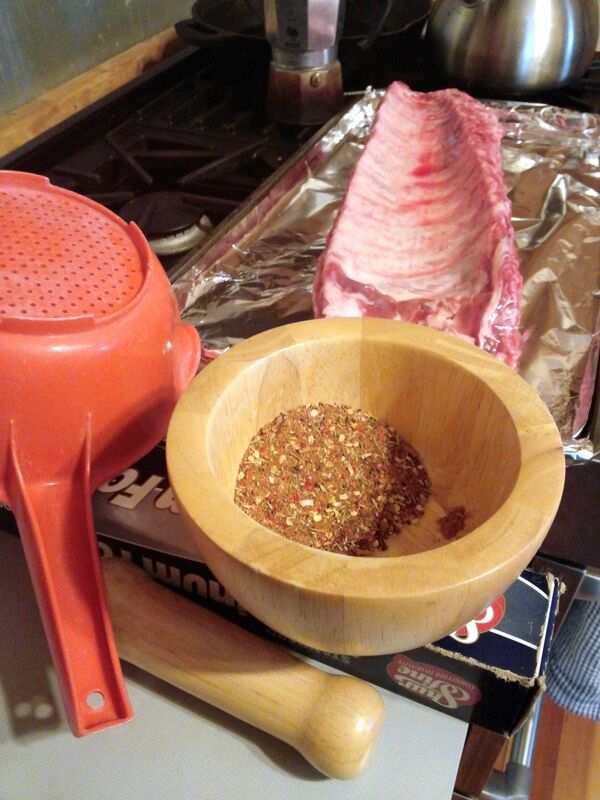 Dry rub ingredients (salt and black pepper not shown). 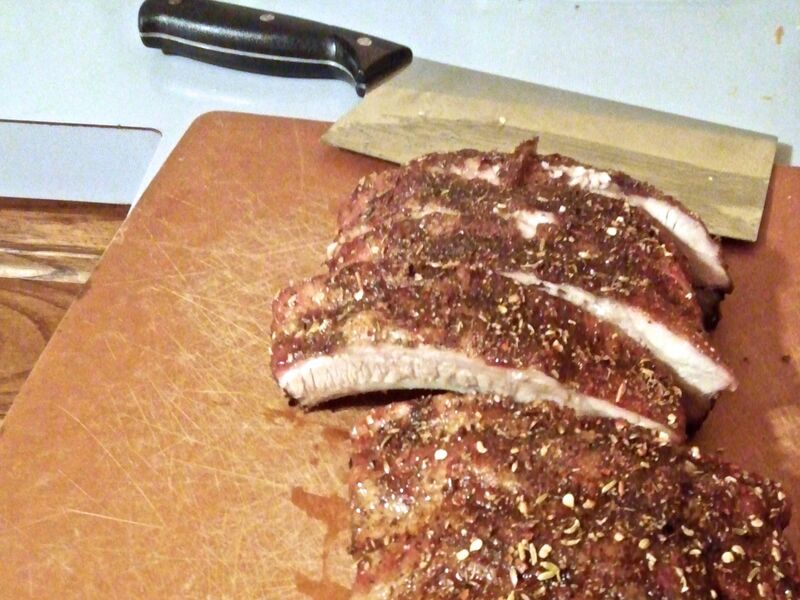 Our sweet and spicy dry rub, inspired by Chinese five spice powder, consisted of: ground clove, cinnamon, whole star anise, fennel seed, dried chili peppers, along with dry rub staples: brown sugar, freshly ground pepper, and kosher salt to taste. 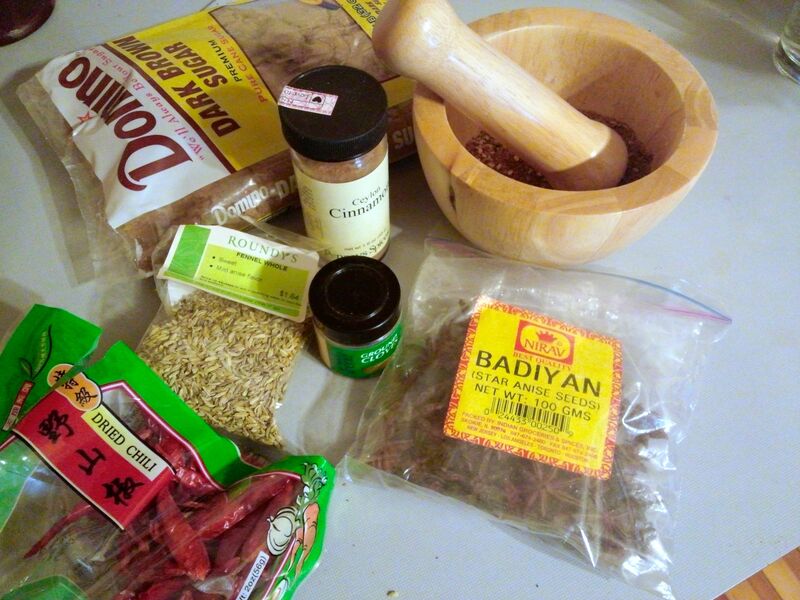 All these ingredients were ground together with a mortar and pestle until most of the ingredients were crushed finely, yielding about 1/3 cup of dry rub seasoning. Dry rub ready to apply to ribs. 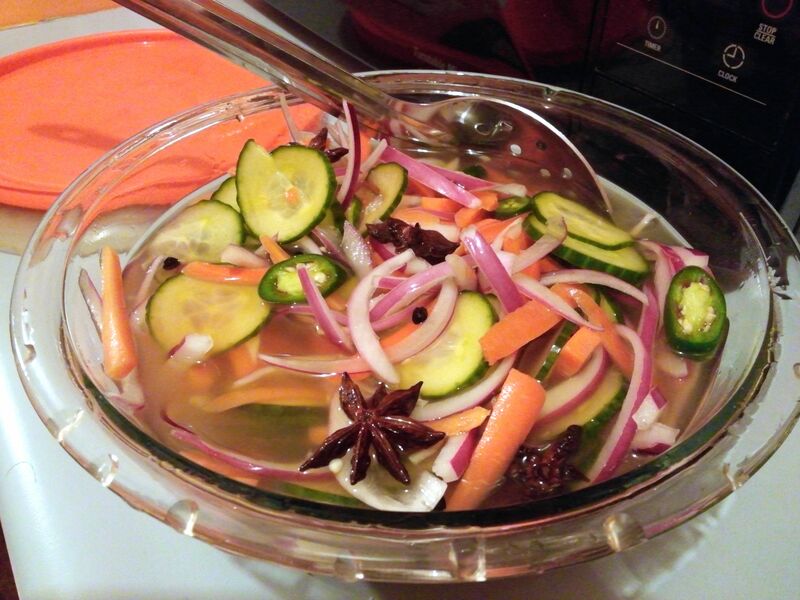 Next we prepared some Chinese pickled vegetables: matchstick carrot, sliced red onion, sliced cucumber, along with a sliced fresh serrano pepper and some pieces fresh ginger. These were soaked in a brine consisting of approximately half rice vinegar and half water, further flavored with some soy sauce, star anise, sugar, whole black peppercorns and a bit of sake. 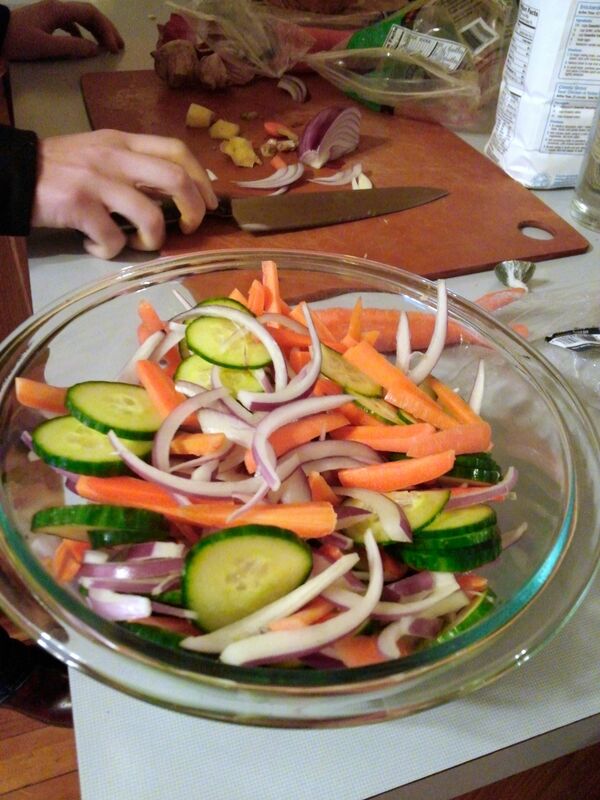 The pickled vegetables where refrigerated for a few hours before use. Pickled vegetables: a condiment for gua bao. Dough ingredients for steamed bao. 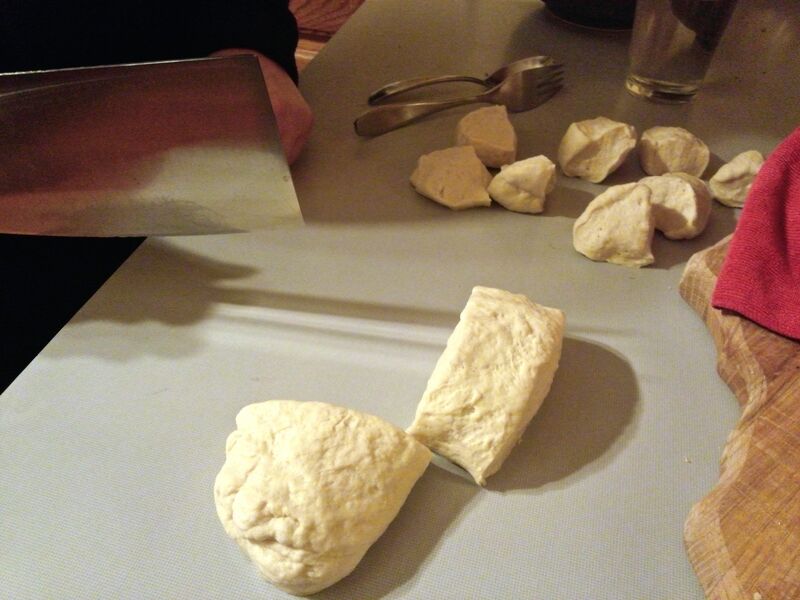 Prepare dough for steamed bao. 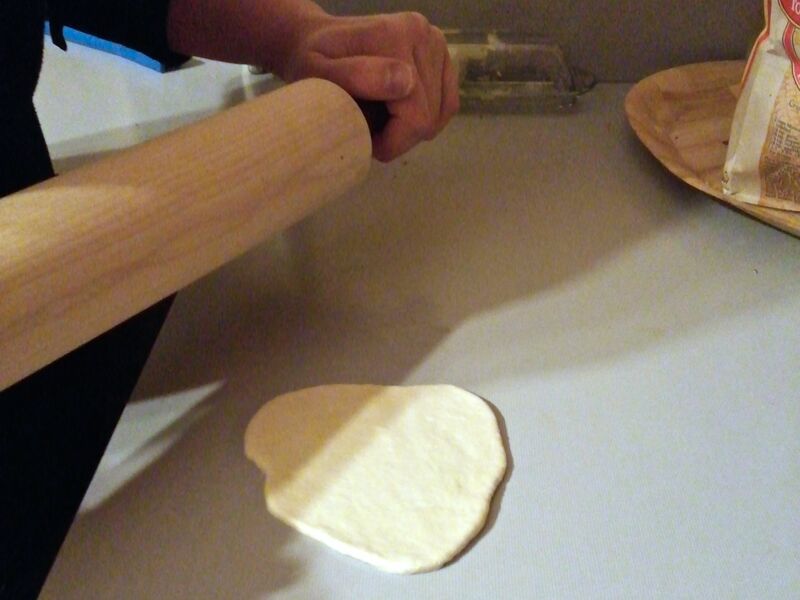 Rolling out dough for steamed bao. 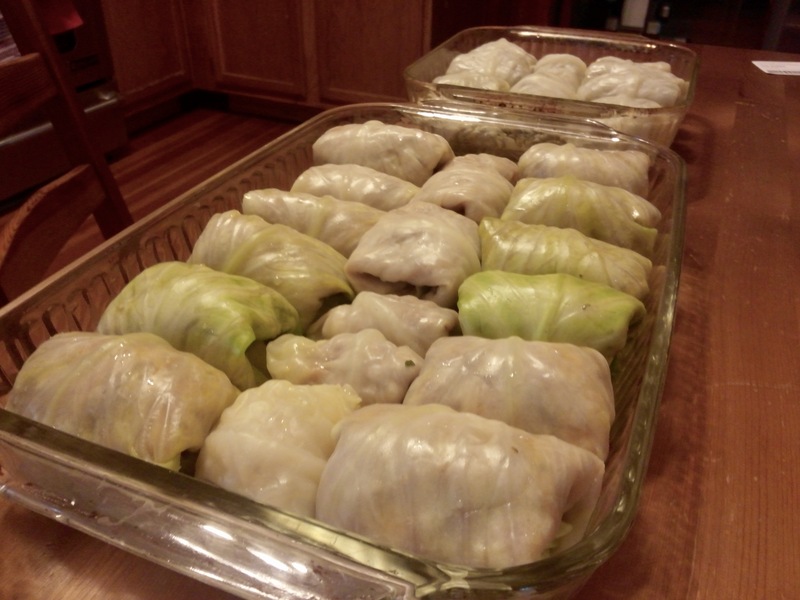 Once rolled-out, the dough pieces were steamed atop cabbage leaves (to prevent sticking), some flat and some folded over, with a bit of oil on the top to prevent the folded ones from sticking closed. We found steaming them (covered) about 10 minutes to be sufficient. Once the rib rack was cooked, it was cut into individual ribs, with some served as-is and some having the meat stripped from the bone to top or fill the steamed bao with a bit of hoisin sauce and accompanied by a condiment of pickled vegetables. 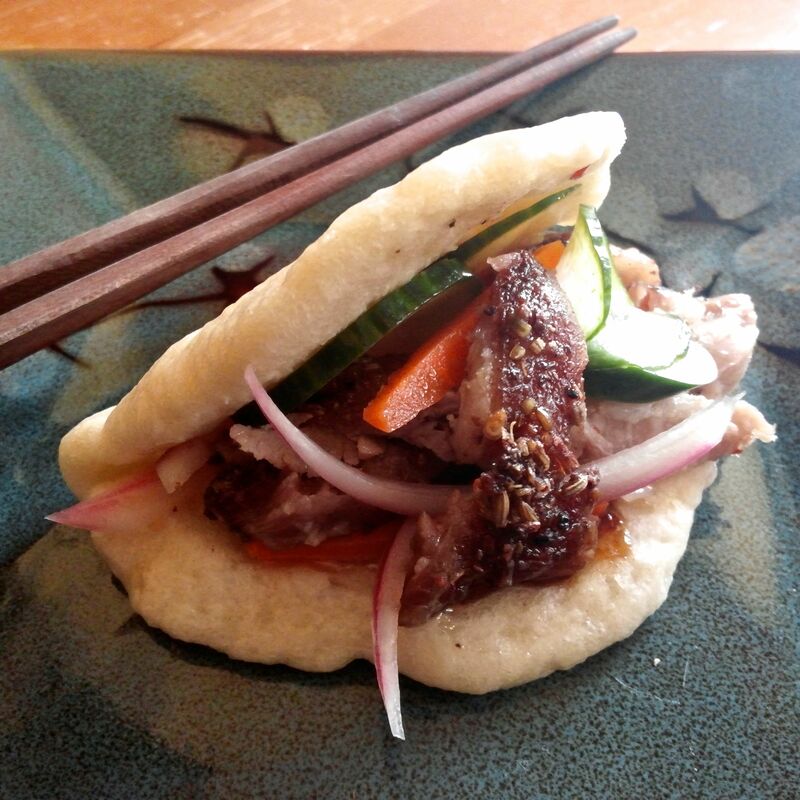 Gua bao with five spice pork ribs, a dab of hoisin sauce, and a variety of pickled vegetables. 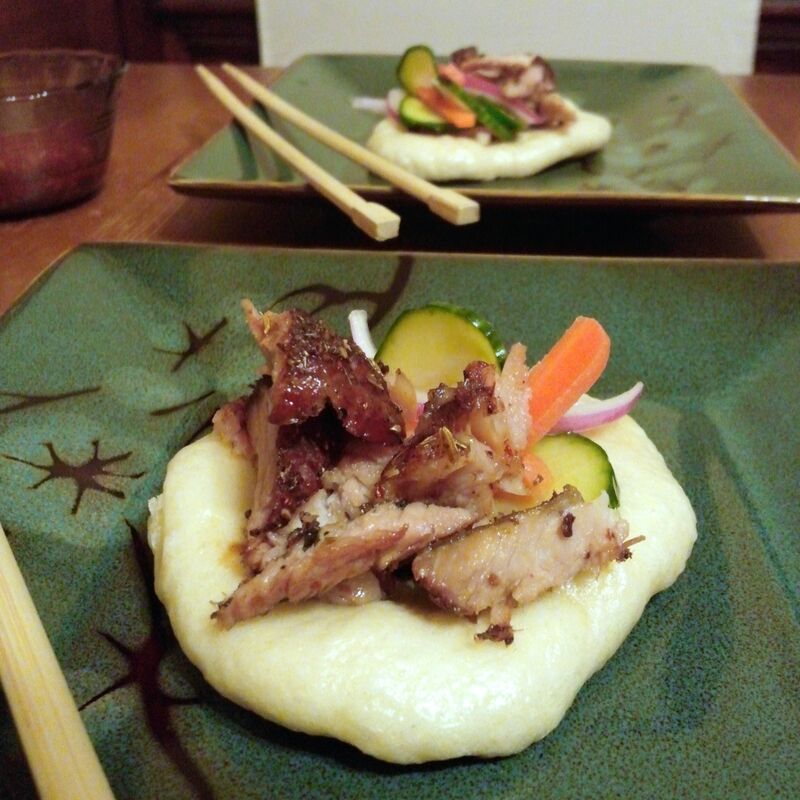 Both the five spice ribs and gua bao were delicious and we enjoyed making this asian treat from scratch. The ribs and steamed bao reheat well in the microwave for some quick and easy subsequent meals. Here are some related recipes that you might helpful if you decide to make gua bao yourself! 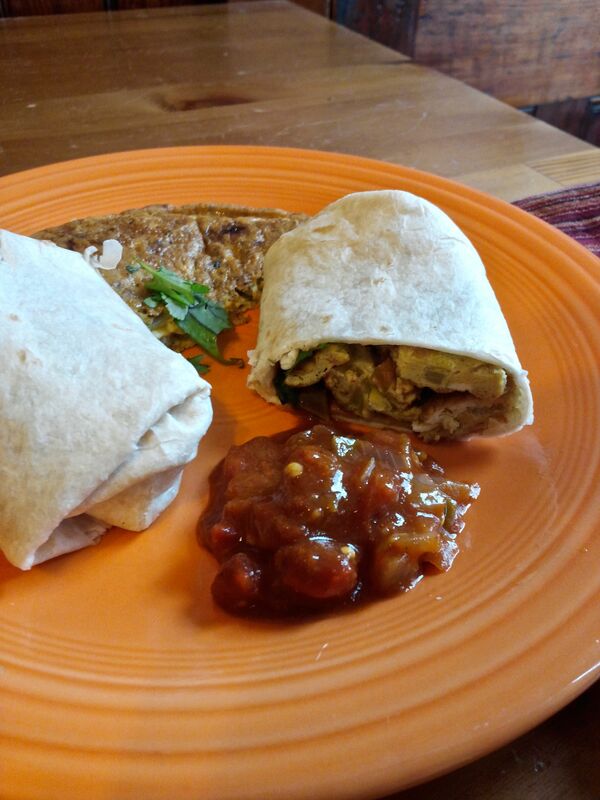 Indian omelette breakfast burrito served with curry salsa. Yesterday, an Indian friend said this Indian Omelet recipe “looks legit,” so I decided to try it; the Indian omelette reminds me of the Chinese omelette, egg foo young, and is prepared quite similarly just with different spices and a lot less oil. As with any omelette beat the eggs, I added a bit of water. Next whisk in all the other ingredients (except the oil for frying). Over medium heat add the oil to an omelette or other non-stick frying pan. 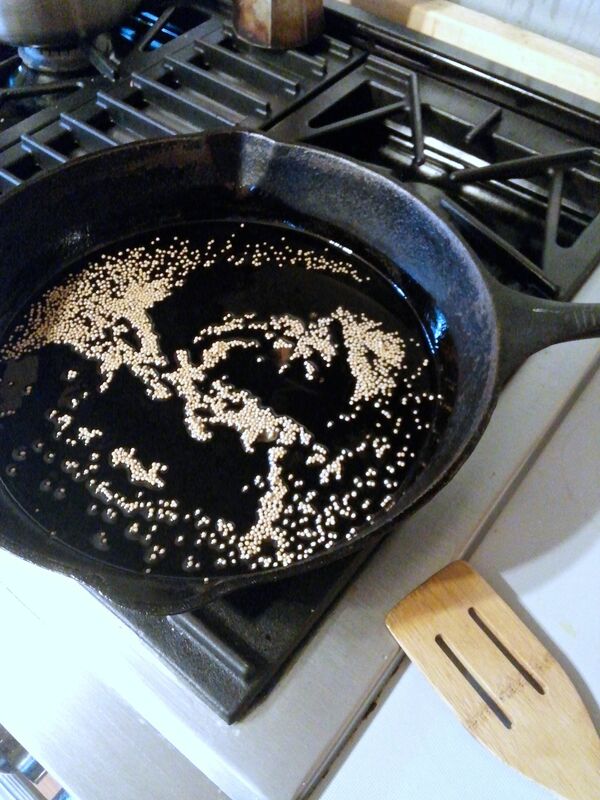 When oil is hot, but not smoking, be sure it’s spread evenly over the pan surface and add the egg mixture, spreading it evenly. Cover immediately with a pan lid or serving plate, and cook for a few minutes, checking to see that it is solidifying, but not yet cooked through. (Expect the bottom to brown in the oil.) Before the egg is completely cooked on top, slide the omelette onto a plate that is larger than the pan, then place the pan upside-down over the plate and flip it over so that the omelette is back in the pan. Cook this other side for a minute or so and slide it onto a serving plate; garnish with cilantro leaf. An Indian omelette topped with coriander leaf. Despite all the ingredients and spices, I found my omelette uninteresting on its own (and I’m not really a fan of breakfasts dominated by egg), so as I’ve done before, I chopped the omelette into large pieces and used it to fill a large, warmed flour tortilla as a breakfast burrito. As an additional burrito filling and flavorful accompaniment, I prepared a hot curry salsa by stirring about 1/2 teaspoon of Indian curry paste into about 1/4 cup tomato-based Mexican salsa. Mixing up a curry salsa. I used less than half the omelette for the burrito and served it with additional hot curry salsa on the side. An Indian omelette and breakfast burrito. This was a nice Indian-fusion variation of the wonderful Tex-Mex breakfast burrito. Another way to make it more Indian would be to use chappati instead of a mexican-style tortilla. I was first introduced to the frozen variety of chappati by an Indian housemate; they’re quite good, you just take them from the freezer right into the fry pan for a few minutes, but the frozen ones are smaller than burrito-sized tortillas, so would make for tiny burritos. 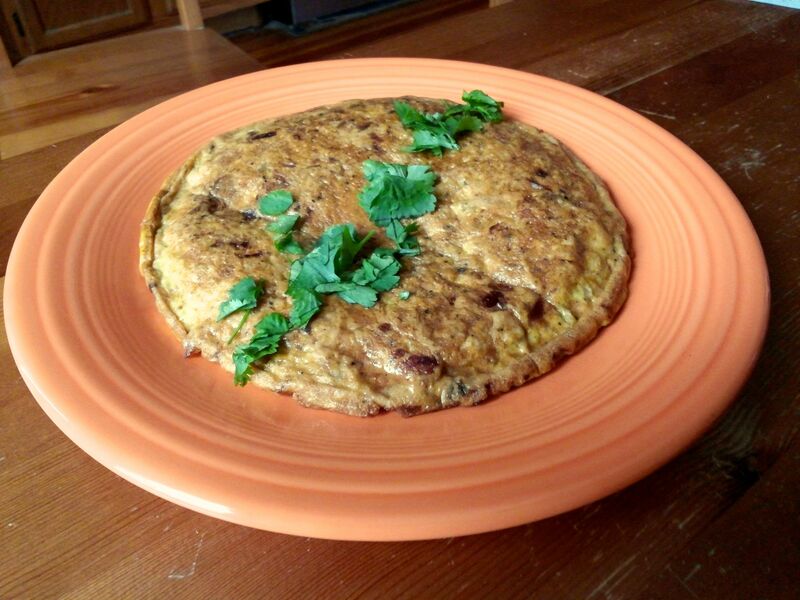 The Indian omelette is yet-another way to put some variety into your breakfasts of vegetables and eggs! 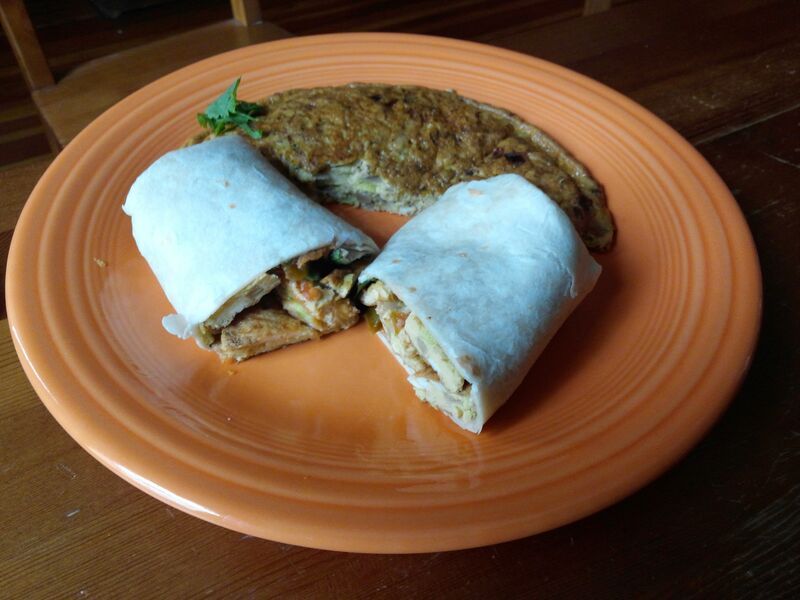 I made an “egg roll,” (nothing like a Chinese egg roll) as in this video, with scallion, black pepper, scrambled egg, and a tortilla and that works out great too and is yet-another breakfast burrito variation!